This time last year my sister Angela came out to visit us. 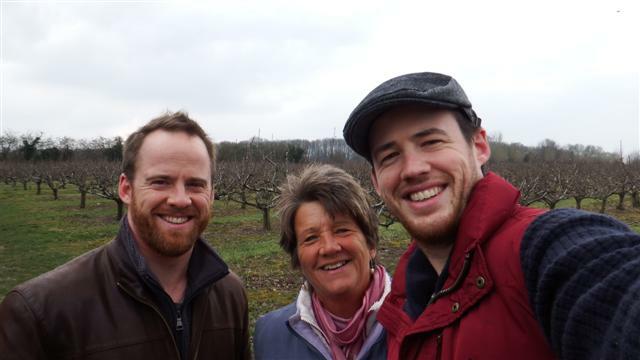 At the time she didn’t have a job, we’d recently lost Mum and she was really lonely on her own. She had a great time with us, I think, and went home a bit more positive. 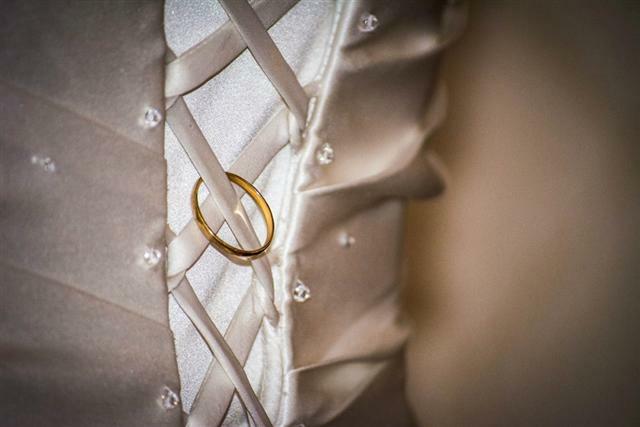 The next thing I heard she had met someone and then just before Christmas she got engaged. 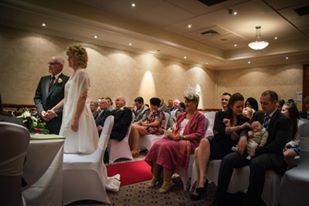 I had planned to go back to the UK in March while Bill was working on Camomile for Mothers day and to see my nieces new baby so Angela decided to arrange her wedding for the same time, which worked out really well. 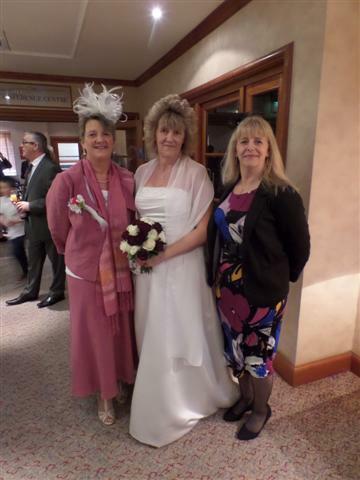 Sunday 29th March was the day of the wedding. It took place at the Apollo hotel at the end of her road. Unfortunately we woke up to rain but the ceremony and the reception were all inside so it didn’t matter. 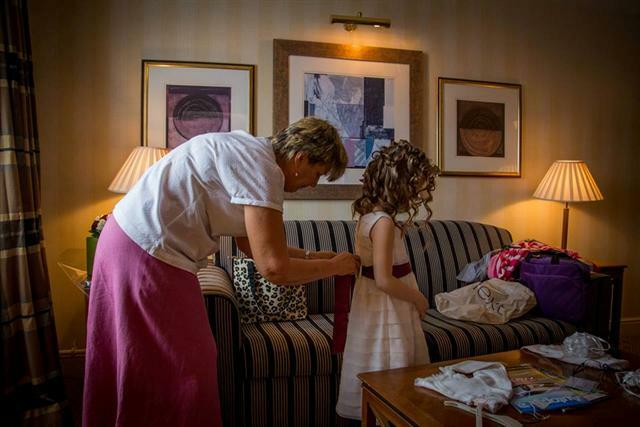 We took our clothes down to the hotel in the morning and Angie’s hairdresser came to do our hair and the little flower girls. 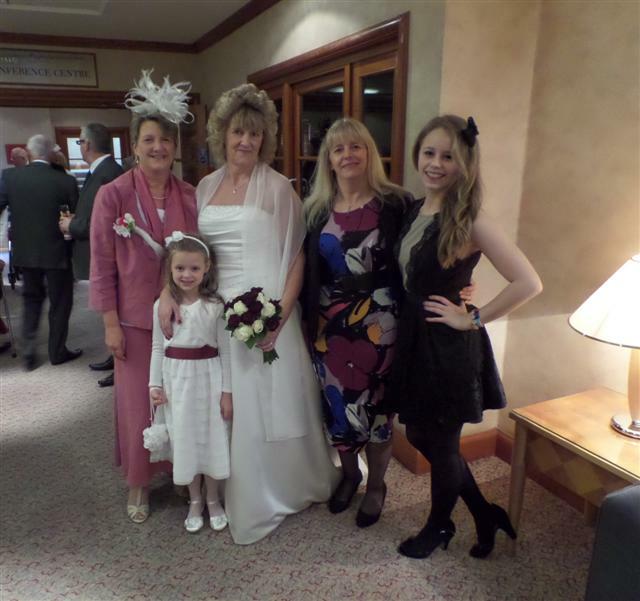 There was Lucie, one of Angie’s grand daughters and Jessica, one of Terry’s grand daughters, very diplomatic. 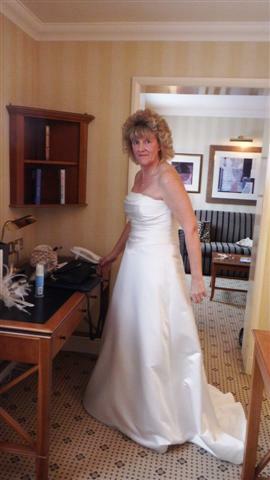 The lady from the wedding shop came to help her get dressed and wove Mum’s wedding ring into the back of her dress. 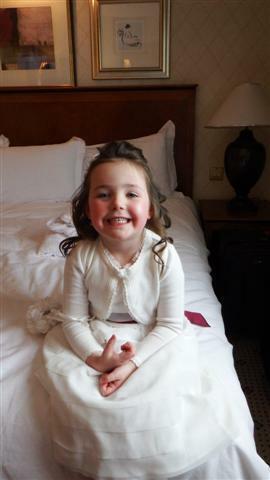 This is Jessica after I got her dressed; she was a bit of a fidget but they both looked lovely when they were ready. 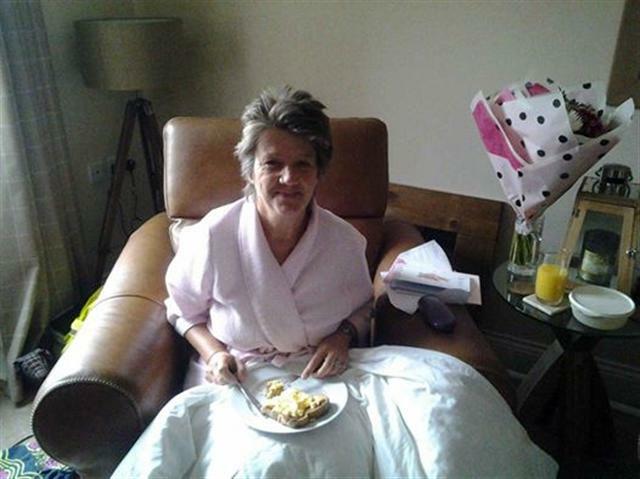 It was an emotionally charged morning because we were all trying not to think if only Mum had been there, she would have loved to have seen Angela settled. 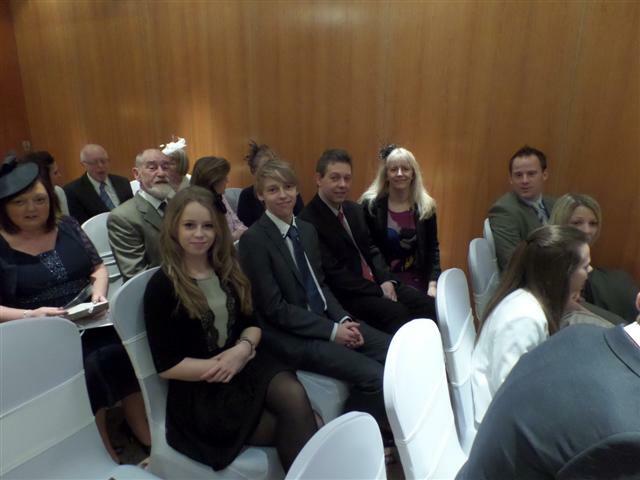 The ceremony room was already starting to fill up with family and friends. 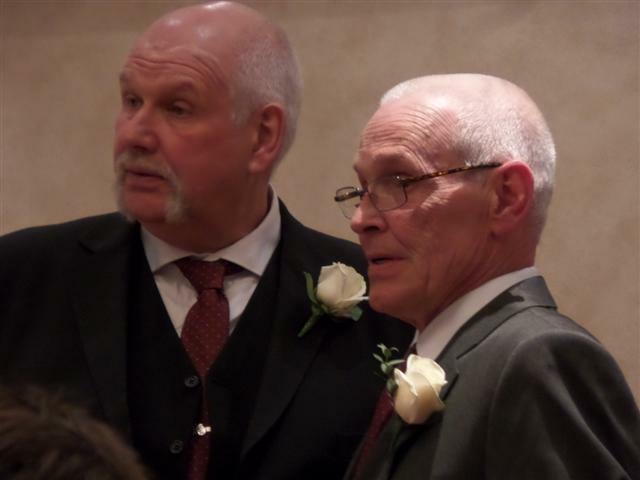 Terry and best man, his brother Mike, were looking a bit nervous because Ang was about 10 minutes late down but eventually she turned up with her son Scott to give her away. The registrar came and asked me at the last minute if I would give a reading, which I was happy to do. Mike and I were witnesses and everything went very well without a hitch. 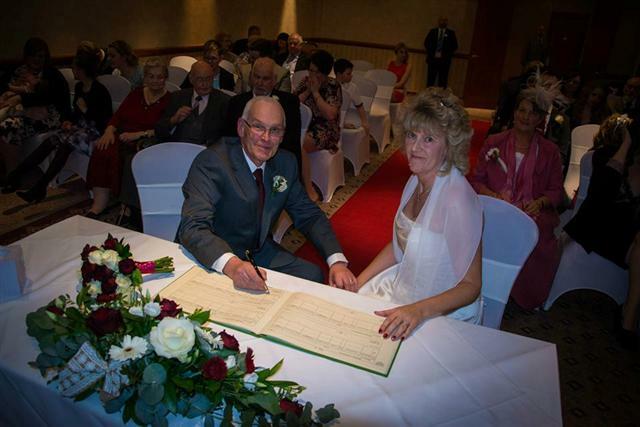 Terry signing his life away! After the ceremony we all moved into the next room while Thomas took the official photos. 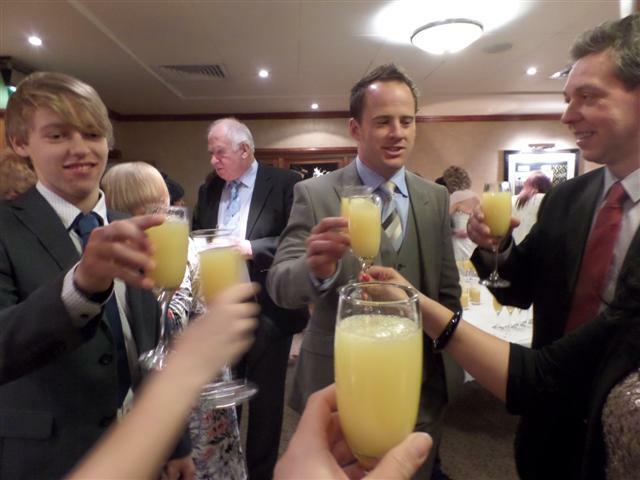 There was bucks fizz to start the afternoon. 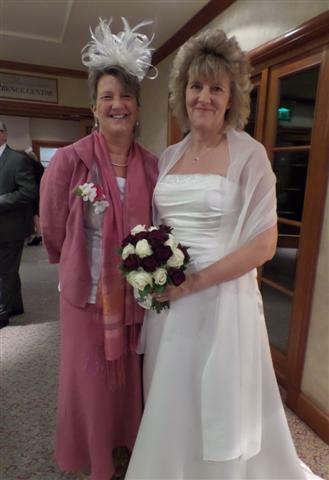 I love this photo of Angela and I; do you like my fascinator? 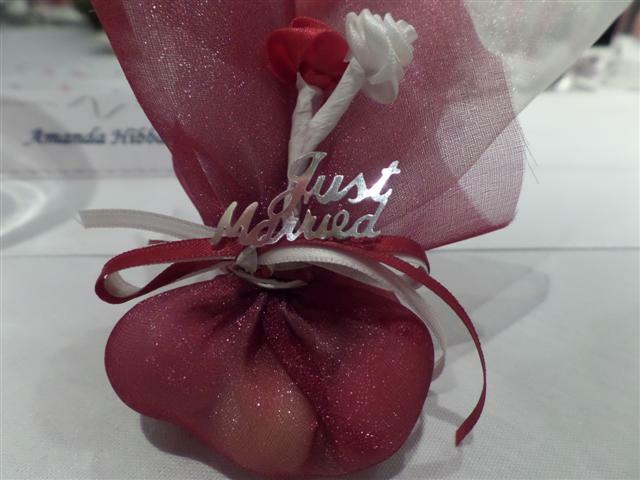 I made it a few days before the wedding with some bits bought from Hobbycraft which cost a fraction of the price they were selling them for in the shops. 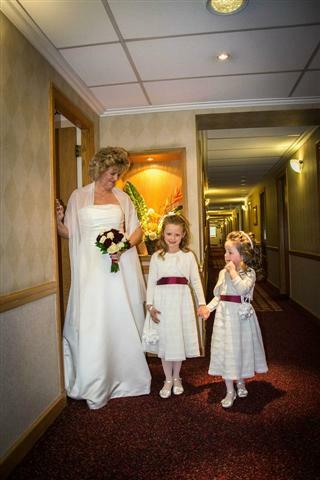 Lovely photo of the three of us. Then we added my sister Amanda. Jasmine and little Lucie joined us too. 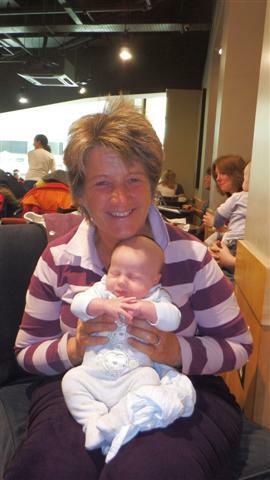 I love this photo of Amanda holding Logan; he’s so gorgeous. 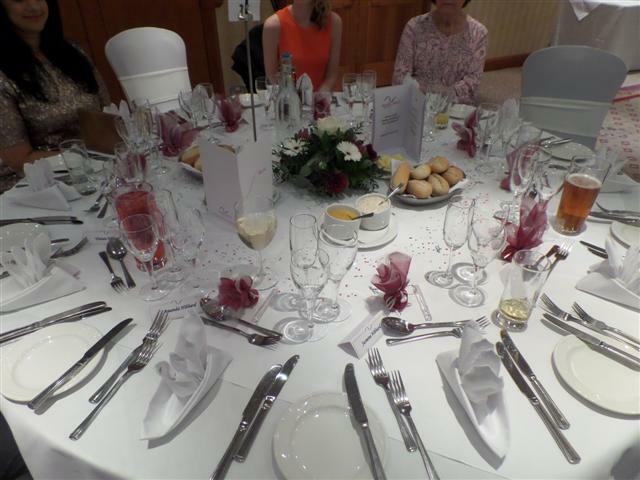 The tables looked beautiful and Ang had made little wedding favours for everyone. It was a lovely meal that started with Melon on a bed of berries followed by roast beef, Yorkshire, roast potatoes and veggies. Then the dessert was profiteroles with chocolate sauce; it was all delicious. 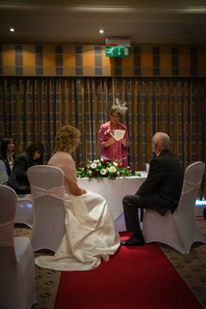 As Dad is no longer with us Angie asked me to do the ‘father of the bride’ speech followed by a toast to their health and happiness; I felt very honoured to be asked. 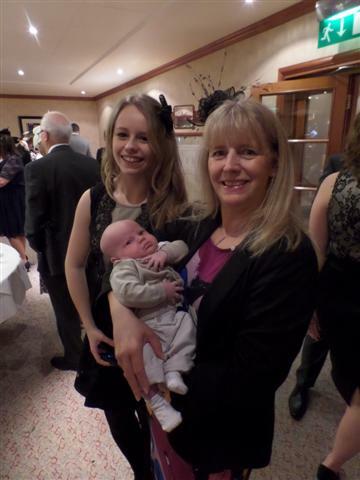 Lovely photo of Terry holding Jessica and Angie holding Lucie. 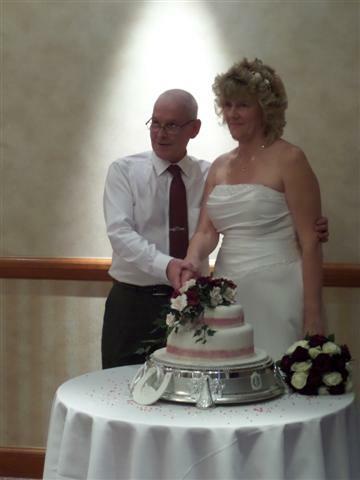 A friend of theirs made the cake, the bottom tier was a fruitcake and the top tier was sponge, it was delicious. After the speeches the cake was cut. 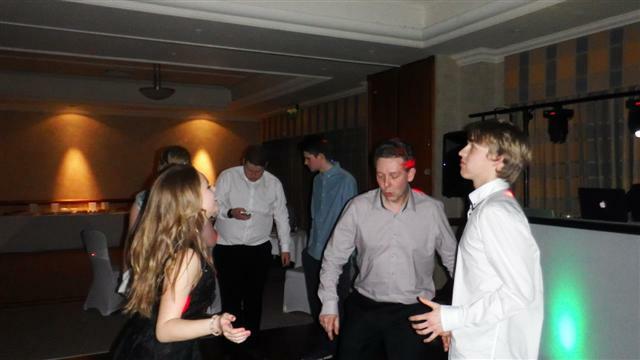 The room was cleared so the dancing could start. 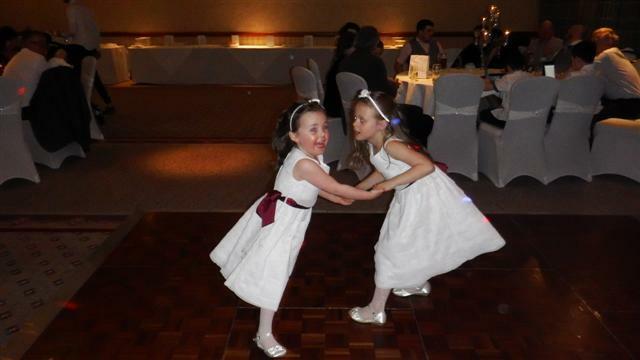 Little Jessica and Lucie led the way. 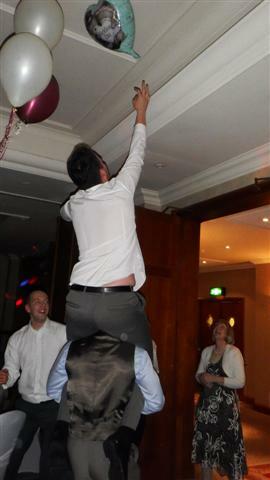 Not sure how this balloon found itself on the ceiling but my boys couldn’t resist the challenge to retrieve it. Thomas couldn’t quite reach at first and James was having to do little hops with his brother on his shoulders! Jasmine and I had a good time. 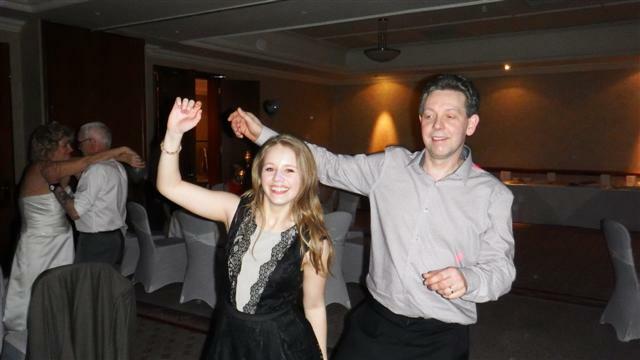 Alan displayed his excellent Dad dancing technique! 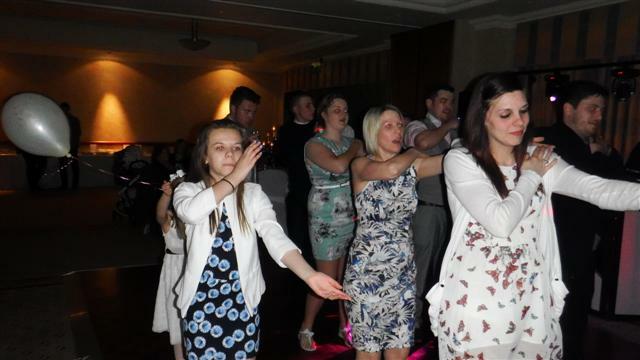 Scott’s wife Karen and their girls joining in with the Macaracca (I think that’s what is was called). 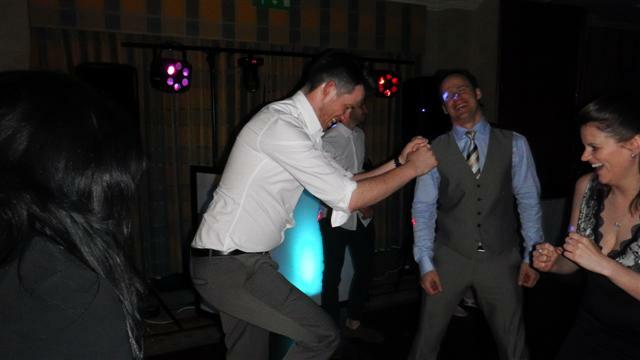 I even managed to get my nephew Tristan to dance. My boys had a great time, they had their cousin Kirsty joining in. 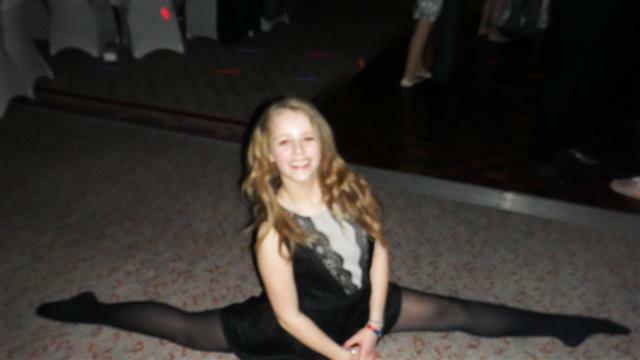 And Jasmine could do the splits! There are some much more risqué photos available but I won’t post them on here, I’ll save them for bribery another day! 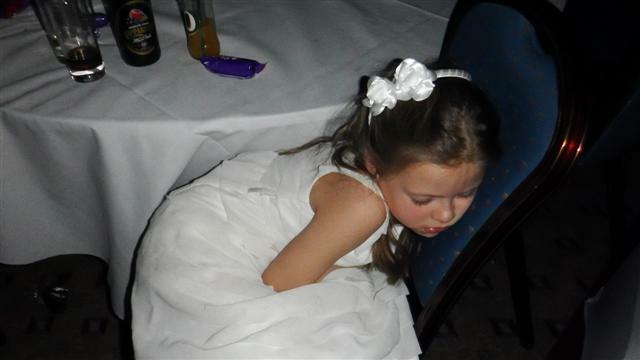 Logan slept through it all; as did little flower girls. 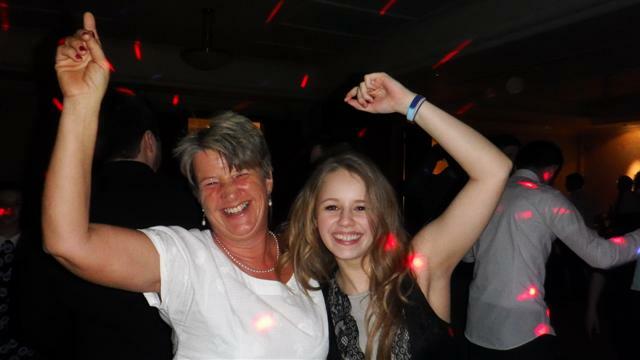 We partied on as only family weddings can. 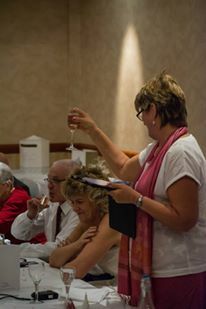 A fair amount of alcohol was consumed but everyone had a great time. 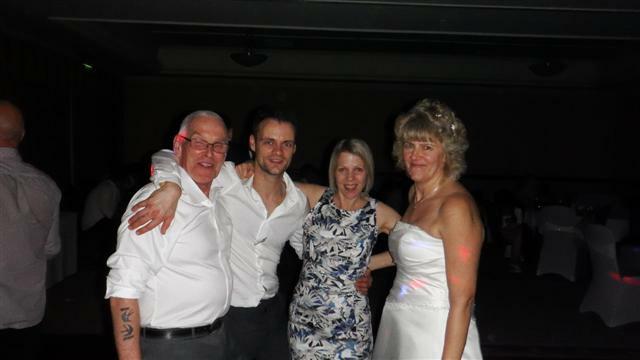 Lovely to see Ang and Terry with Scott and Karen. It was an excellent and memorable day. Week 8 was mostly spent undercoating the topsides and varnishing floorboards. 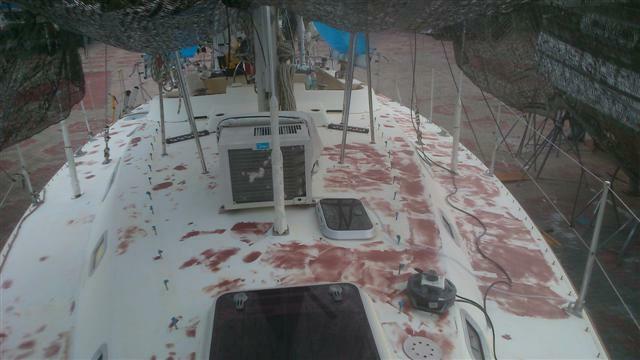 Bill said there were five components to painting the topsides. 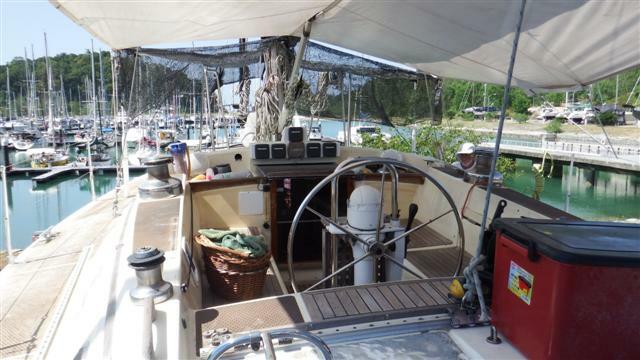 Port side deck, starboard side deck, top of the coach roof, sides of coach roof and the aft deck. 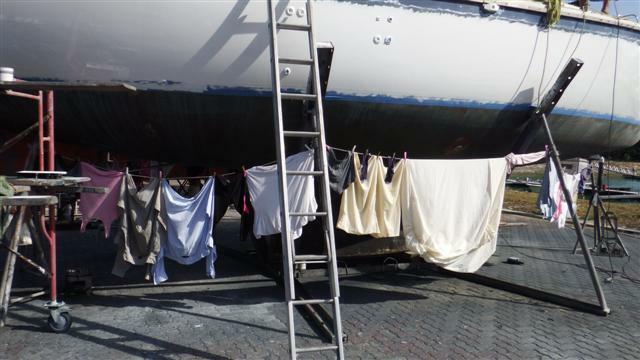 He would get up early to paint the port side deck then the starboard side from the scaffold tower before it got too hot. 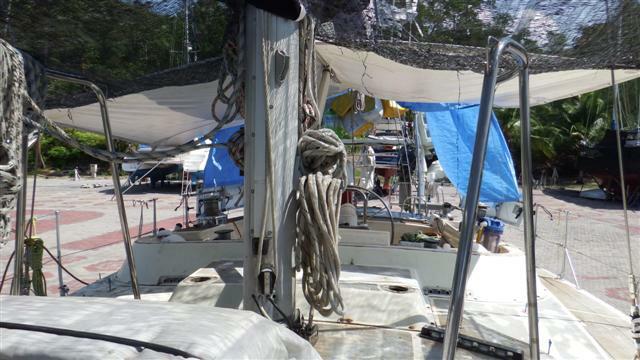 The next day he could paint the top of the coach roof and the sides of the coach roof while on his knees and finish off with the aft deck. Another day to rub it all down and repeat the process again. This didn’t take up all his time so as I was away he took up the floorboards from down below, took them under the boat to rub down then laid them out in the cockpit to revarnish. 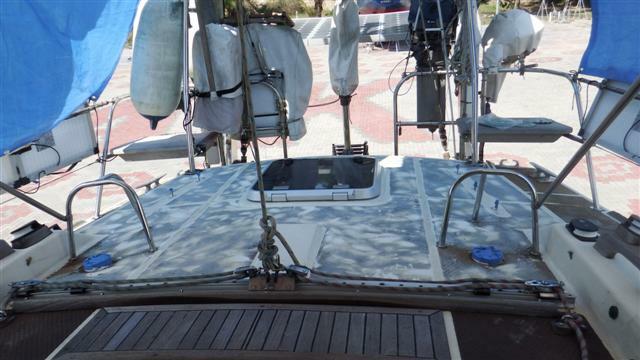 This shows the floorboards drying in the sun with a masked up aft deck in the background. 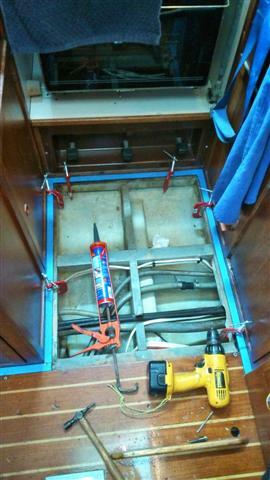 This is my galley floor where the edges had recently come loose so Bill’s stuck them back down again with Sikaflex. The steps were out and they were rubbed down and varnished too. 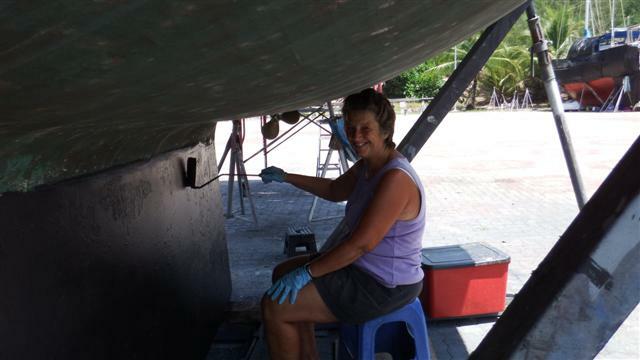 Another job Bill wanted to do was repair the joint at the forward bulkhead where it meets the hull. 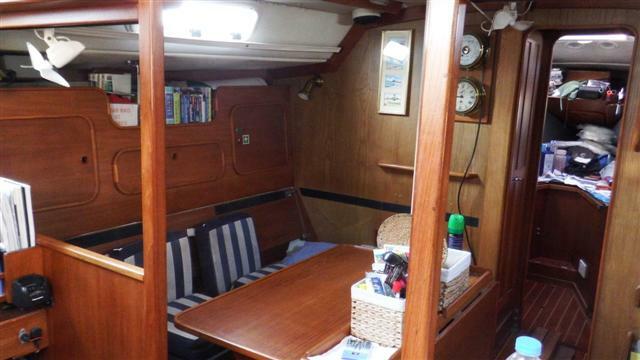 It had been repaired shortly after the boat was built, before we owned her, but the repair had failed so Bill reglassed the joint between the saloon and the heads (toilet). Thursday 26th Bill went into town to pick up the gloss paint that had finally come in so that he could start the topcoats next week. I was half way through my trip to the UK. The good news was that Bills new passport had arrived at my sisters, followed by his old one the next day so that was that sorted. The bad news was that the immersion heater on the boat had failed and was added to my shopping list. 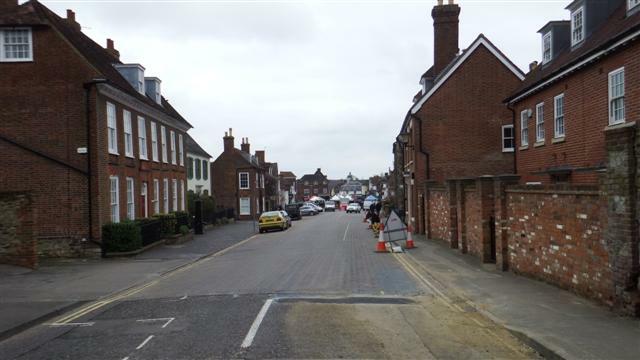 This is West Malling a beautiful village in Kent just over the hill from our old house. 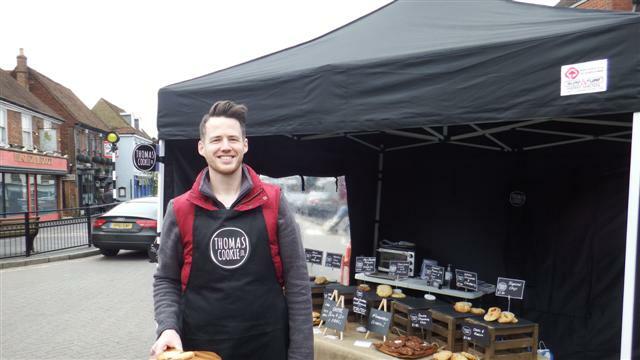 It was the setting for the farmers market that week where Thomas had set up his cookie stall. I had driven to Kent on the Saturday afternoon just because I could! I wanted to go to church on the Sunday morning. The Teston church (our old village) only has a service once a month but Father Jim also administers over Wateringbury and East Malling. I had been going togo to Wateringbury but at the last minute I decided to go to East Malling and there was Father Jim. It was wonderful to see him and take communion. I felt very emotional being inside a church again, something I’ve really missed. While Thomas was selling cookies Sonal and I had a lovely coffee sitting in the spring sunshine before we went for a lovely walk in the park with Honey the Dashund. The English countryside was beginning to wake up and a few leaves were starting to bud on the trees. 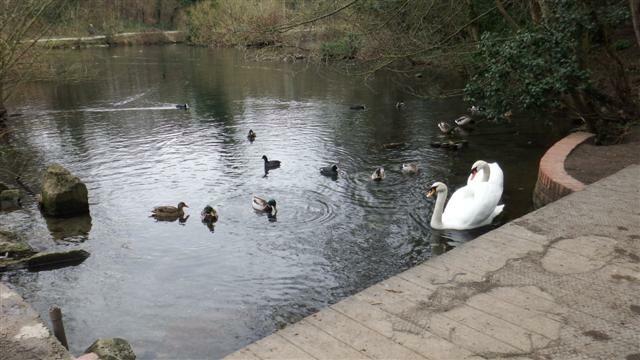 These swans looked very pretty in the park. 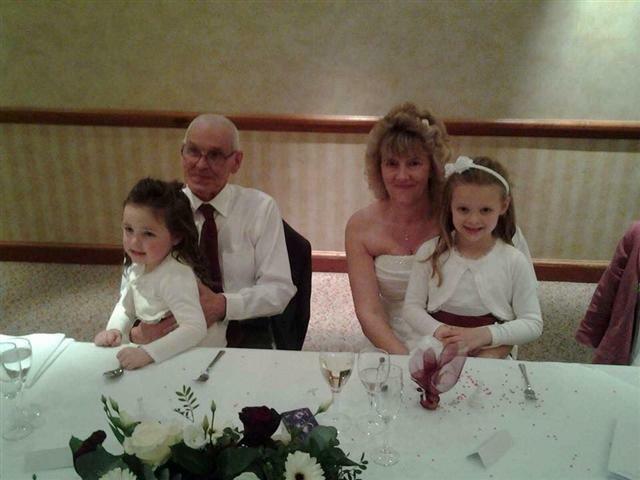 In the afternoon I drove to Havant to spend the night with my sister-in-law Claire and her husband Gordon. I was there on the right day because they were in the process of sorting their DVDs out and I scooped a bag full. Thank you. 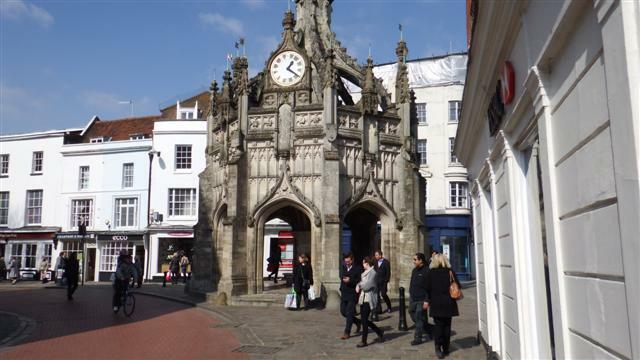 The next day I drove into Chichester to have a look around the shops. I got a nice top for the wedding, my wizzy wiz things from Lakeland, but more importantly Bill’s stainless staples that I had spent ages looking for. Good old Messams, you can’t beat the little old-fashioned hardware shops. Liz and I after a lovely evening of catching up. 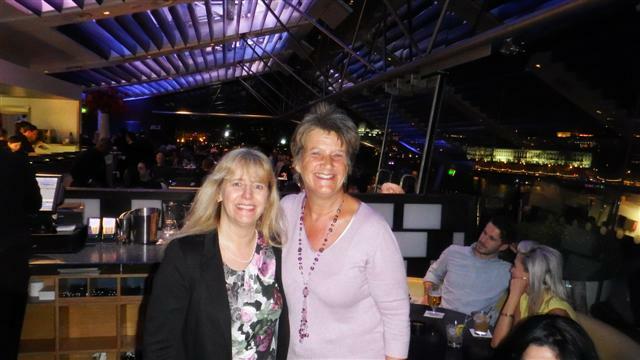 After a lovely lunch with Claire I continued onto Southampton for an evening with our WOA friends Liz and Julian. Their Westerly is in Turkey but it was great to catch up with them. So 3 nights in 3 different beds and it was back to my sister’s in the rain. To be fair the weather had been very good during my stay and this was only the second lot of rain we I’d had. 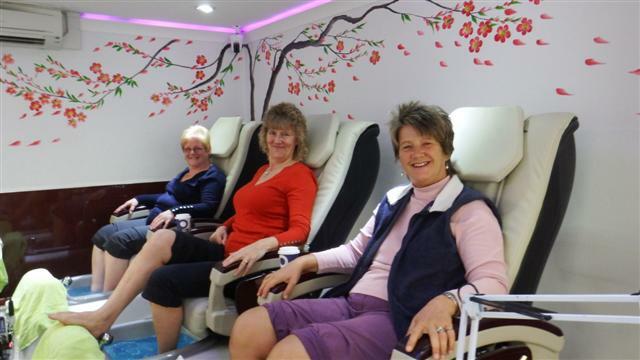 On the Thursday Angela, her friend Pat and I had a pamper session before the wedding. Our nails looked beautiful after this, not sure how long they will last when I get back to the boat. It’s a short blog for this week because Bill didn’t take any photos. Friday 13th March Bill rebuilt the window gaskets, which had cracked up due to the UV damage, by cutting them back and filled and filleted them with filler (taken from Bill’s notes). 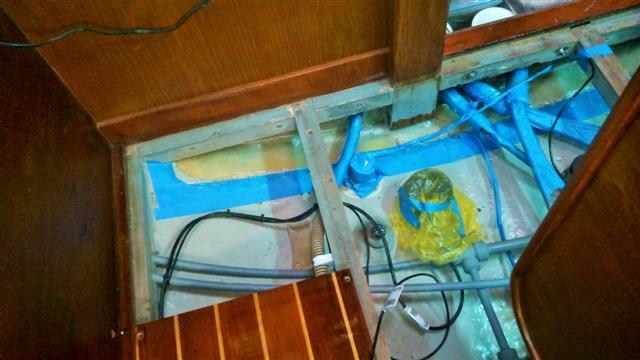 He also finished bonding on the rest of starboard rubbing strake. Saturday 14th March Bonded on port rubbing strake and sanded both sides. They look superb, I took this photo when I got back. Sunday and Monday more rubbing down and more fairing and more rubbing down which took approximately 60 hours altogether. Before I left we agreed that Bill would concentrate on the inside jobs and not take the stanchions off (they stop you falling over the edge) until I get back and we go back into the water. The painting of the decks was going to wait until then but Bill had been speaking to some of the locals and was informed that once the rains start in April painting becomes difficult. 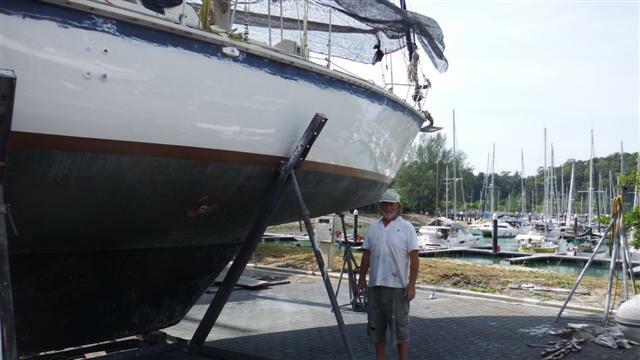 Also Bill decided that it was easier to paint the decks from the scaffold tower rather than on his knees so the stanchions came off so he could complete the deck preparation for painting. As Bill discovered they were badly corroded they were also added to my shopping list! 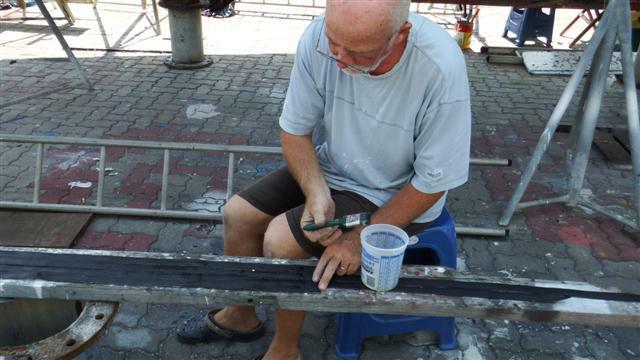 Tuesday 17th Bill spent most of the day organising a new lot of primer, undercoat and topcoat in Kuah town. Unfortunately the topcoat was out of stock but he bought enough primer and undercoat to keep him busy. The rest of the day and most of Wednesday was spent masking the decks. Thursday 19th and Friday 20th were spent priming and rubbing down in between coats. Meanwhile having spent two and a bit days with my younger sister Amanda in Surrey, resulting in me driving off in my brother-in-law’s car (all arranged), a days shopping at Port Solent (in the chandlery not a shoe shop!!!) 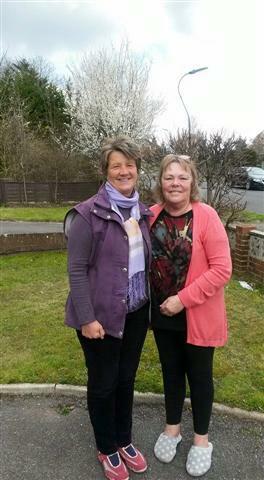 followed by two and a bit days with my middle sister Angela in Basingstoke, I had caught up with all the gossip and was thoroughly chatted out (almost)! 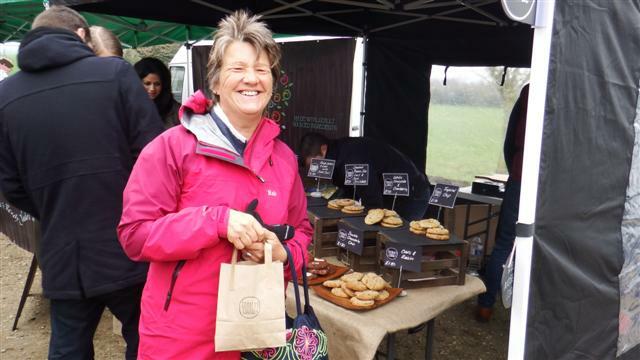 Friday 13th I drove to a trailer company to pick up two tyres and inner tubes – why? – for the dinghy wheels of course! You won’t believe the shopping list I’ve got, I’ll list it all before I return. 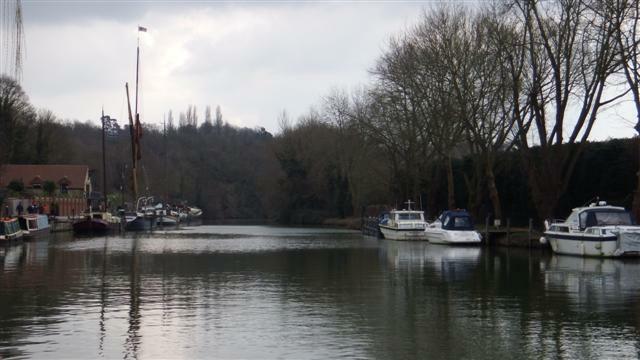 Lovely but wintery river Medway in Kent. I continued over to Kent to see Thomas; so strange to be able to drop in and see him. I spent the night with Sally and Rob again, and had a lovely evening with cousin Wendie and Haydn joining us, so I could be up early to Gatwick to pick up James. I hadn’t seen him in over a year and it was good to see him again. We drove straight to Kent to join Thomas. Here are my two boys or I should say young men now. 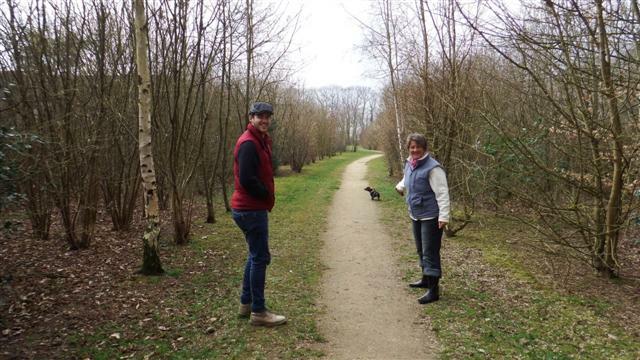 Thomas had borrowed their friend’s dog for the weekend and we all took her for a walk, so normal. Back at the house Thomas was preparing cookies for baking. This is his new business venture, check out his website www.thomascookie.co.uk I hovered for rejects but there weren’t many. 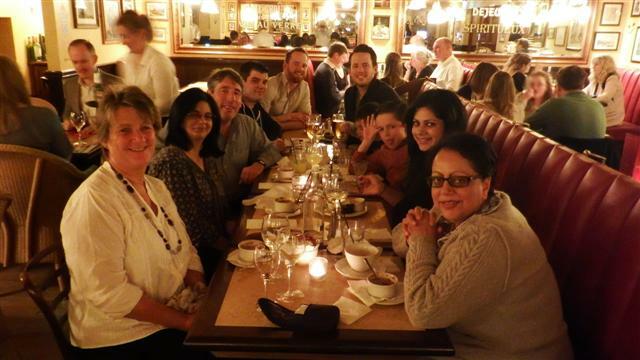 That evening I had the pleasure to meet some of Sonal’s relatives when we all had a meal together. 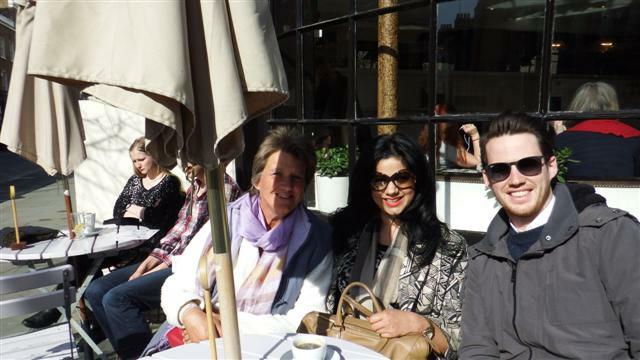 In the picture we have Nalin and Andy sitting next to me, next is Dave, who is involved with the Cookie company too. 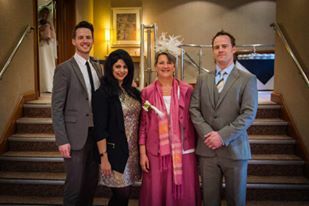 Then my James and Thomas, Little James and Ben are next then Sonal and her mum Meena. The little boys were so well behaved, so unusual these days. 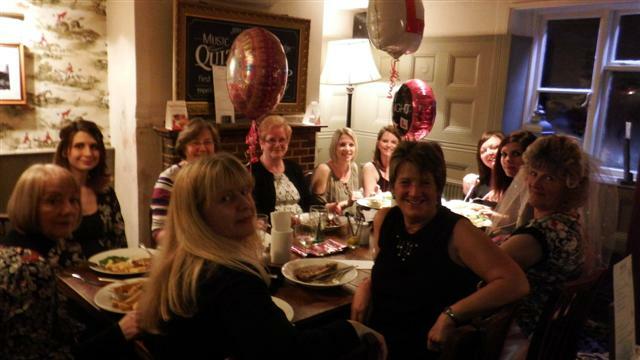 It was lovely to meet everyone; we all had a really nice evening. The next morning was Mothers day, my first with the boys for about 6 years. 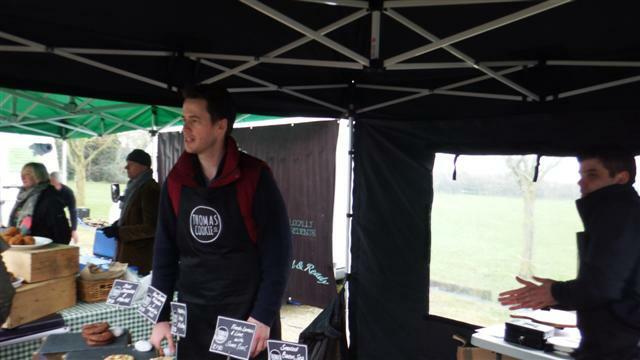 James cooked me my breakfast before he and I drove to Aylesford Farmers market to see Thomas’s stall. It looked very professional. 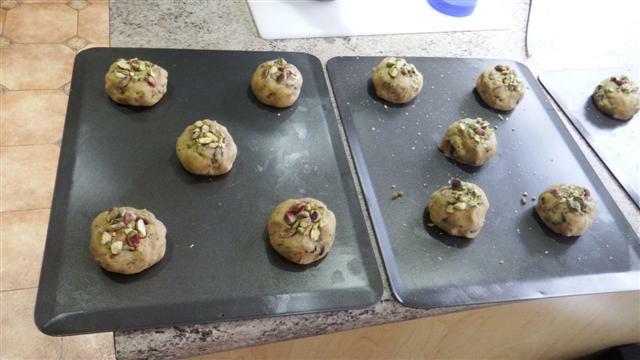 I bought some cookies with a small family discount! In the afternoon James and I drove to Sonal’s brother Amit’s house and had a delicious meal with Thomas and Sonal, Sonal’s mum Meena and Amit’s wife Jen. 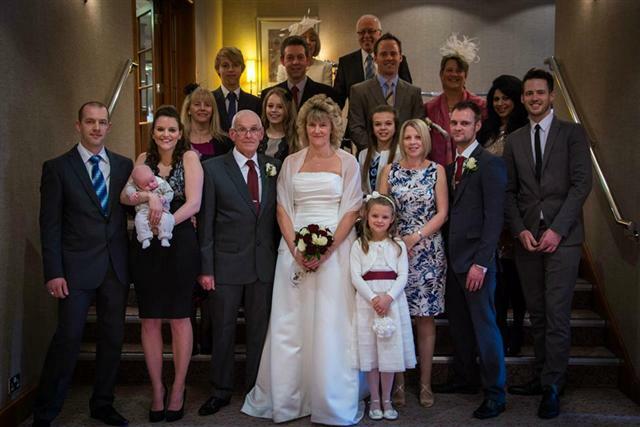 It was a lovely family occasion. Monday 16th Thomas took James back to the airport and I headed to the outlet centre in Chatham to buy some bits for me, some for Bill and some for Camomile. Tuesday I headed back to Angela’s to meet this little chap, isn’t he gorgeous. Logan is 6 weeks old here and I love him, he’s so good. 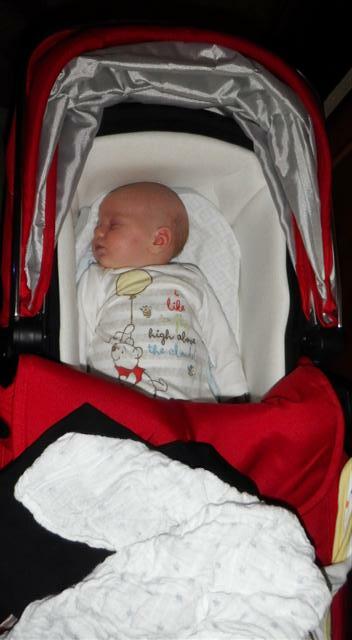 My first great nephew, makes me feel quite old. I spent the next 3 days shopping for boat bits either online or in the chandleries in Southampton. 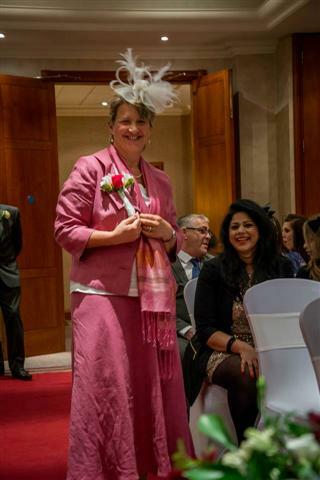 Friday 20th March was my sister’s hen night. Fortunately we all opted for a nice meal in a restaurant so no men taking off their clothes! It was a lovely evening with not too much to drink. After dropping me off at the airport Bill went into town to do some shopping (and probably had a McDonalds) then went back to Camomile to continue clearing the decks of the awful Treadmaster that he and Norman had started the previous week. He did 4 hours of stripping before sunset. Friday 6th March 11 hours of stripping followed by dinner with our friends Rex and Susie on Ariel. I think whisky was involved! Saturday 7th March he ran short of abrasives so he worked to 11.00 borrowed one of Mr Din’s cars and came back to do some more sanding. 8 hours of stripping today. Sunday 8th March Camomile was starting to look very white as Bill continued to clear the deck of Treadmaster backing. 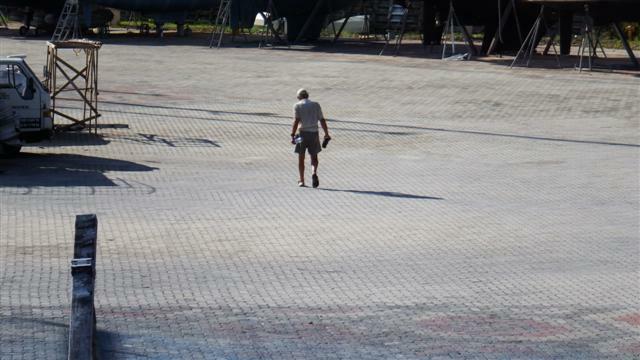 He stopped for lunch at HDC while the sun was at it’s hottest then carried on. 11 hours worked again. Monday 9th March The bow, the coach roof and a little of the cockpit still to do. 11 hours worked again, he’s now ground off all but a small patch under the air conditioning unit. The removal of the treadmaster has taken 48 hours of Bill’s labour with the addition of 25 hours donated by Norman of Norsa; a total of 73 hours, phew! Tuesday 10th March Bill moved the air-conditioning unit to the cockpit so that it pumps through the entry hatch, he didn’t want to not have it on, it cools the inside of the boat to make it bearable to live here. After removing the last of the treadmaster from where the air con unit had been, he then removed all the deckfitting that were going to be in the way and did the first fill of the major dings and redundant holes. 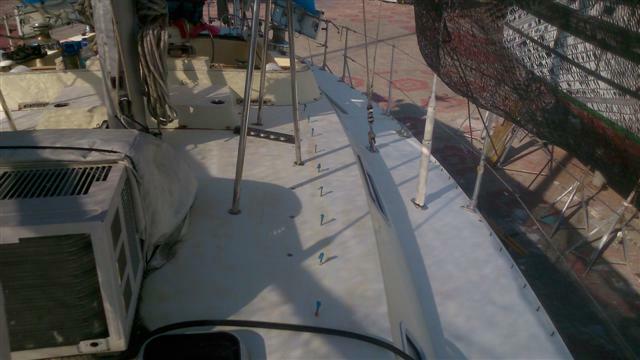 The next 2 days he spent fairing and filling plus he returned to the bonding of the starboard rubbing strake. Meanwhile I landed safely in England after 3 flights and 27 hours fortunately the last flight to Gatwick was half empty and with no one sitting next to me I was able to lie down and get some sleep. I spent the Friday quietly because I didn’t want my sister to know I had arrived as I was planning to surprise her for her birthday. 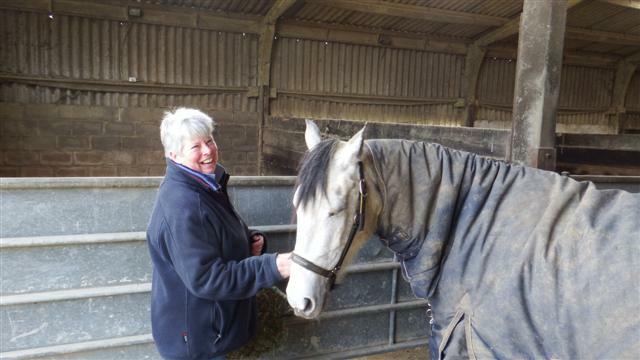 Cousin Sally picked me up and we had a lovely day visiting her horse Maud and driving around the beautiful, but still wintery, English countryside. Saturday morning I jumped on a train to meet Thomas and Sonal in London, not having seen them for 6 months it was great to catch up. 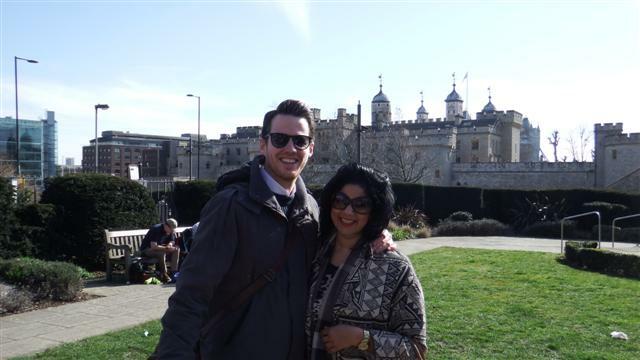 The first job was post Bill’s passport before coffee in the sunshine and then a visit to the Tower of London. 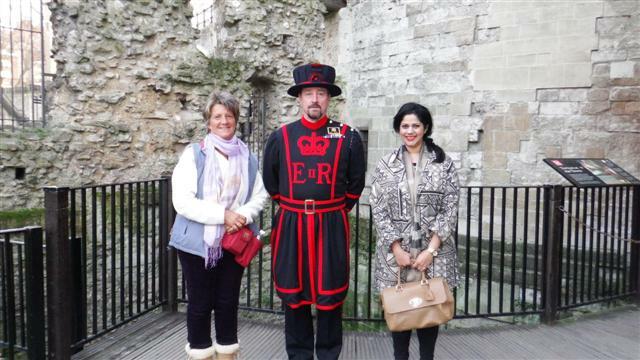 It was a cold but sunny day and we had great fun wandering around the tower listening to the Beefeater’s stories, which I swear get taller every time I hear them! 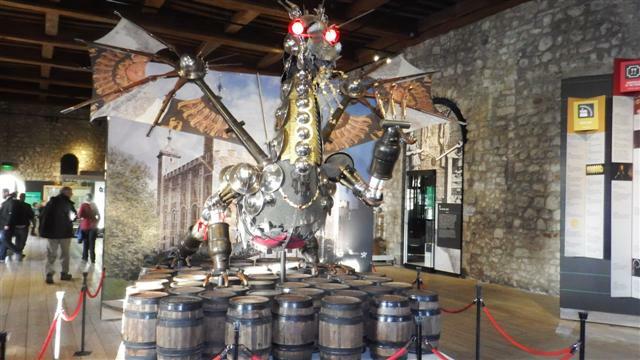 This amazing sculpture is made from weapons and armour, very clever. 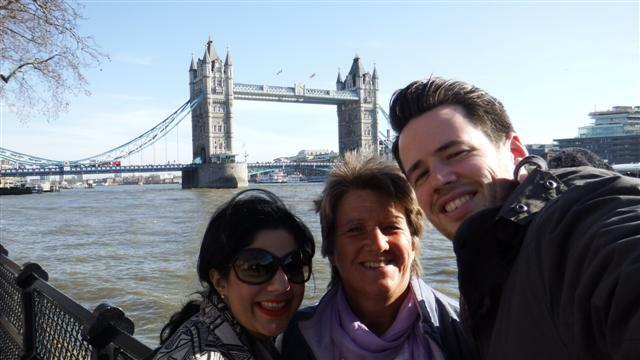 As it was such a nice day we continued walking across Tower bridge and on towards the Oxo tower where we had arranged with my brother-in-law Alan to meet to spring the surprise on Amanda. Her face was a picture when she walked in and saw us. It was a good start to my ‘holiday’. 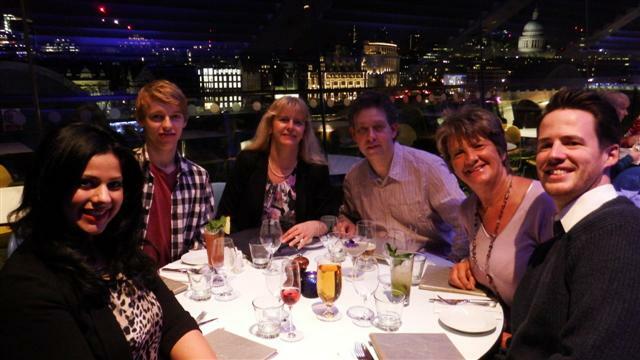 Dinner at the OXO tower with a stunning view of the London skyline in the evening – best table in the house! 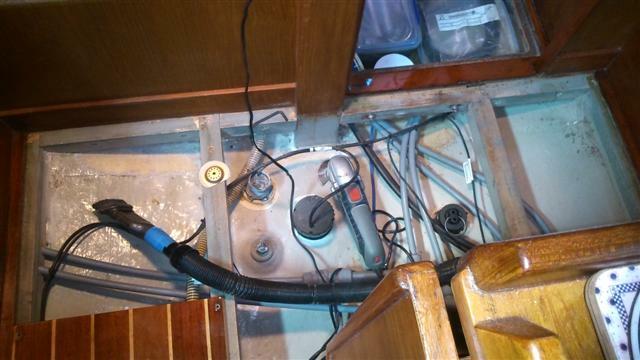 Continuing on with the story of the refit. Saturday 28th February Bill continued to remove the toe rails. 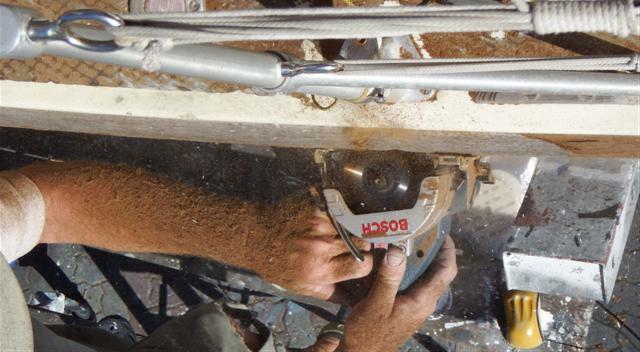 The problem Bill had was that the toe rails could not be removed by removing their screws because they are glassed in underneath the deck and to remove them would turn into an extremely messy and lengthy job. 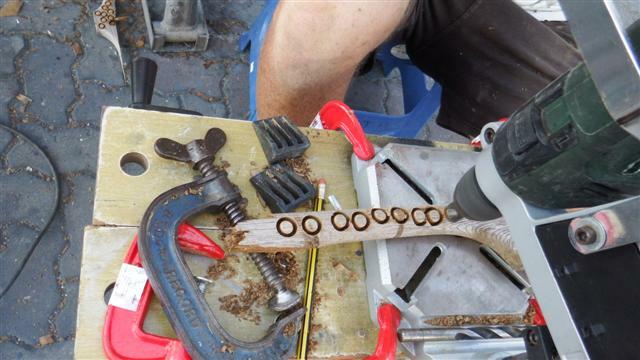 His plan was to remove the screw heads with a special tool he bought in Australia. It works with a pump action sawing movement and within a minute the screw head pings off. The next process is to get a crowbar and some screwdrivers underneath the toerail and gradually but carefully prise it off in one piece because Bill needs them intact to use as a pattern for the new ones. Each one in marked with the position it came from. It took him the best part of two days to remove them all and sand the deck underneath them all. 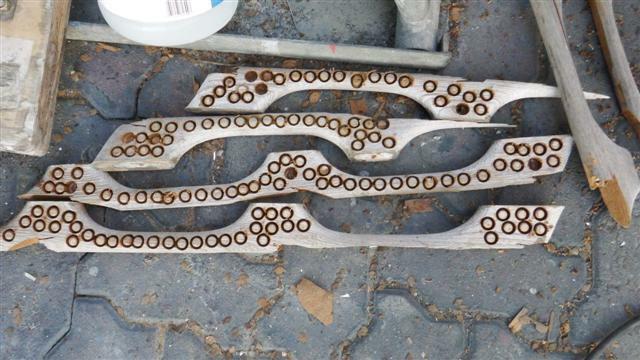 This is what the deck looks like with all the studs sticking up. He removed the grab handles in the same way. 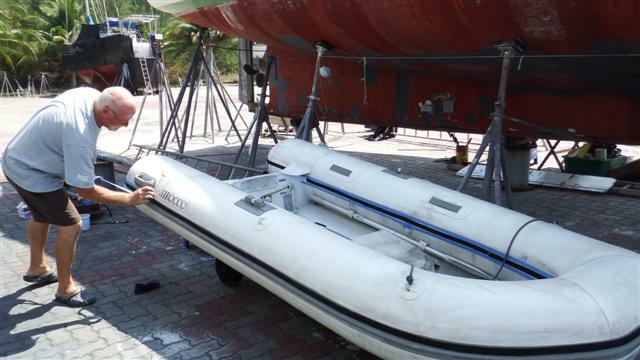 Meanwhile I was busy sewing the Velcro on the dinghy cover and fitting it onto the Velcro strip on the dinghy. It all fitted very well but I failed to take any photos. I took it off again because I don’t want it covered in dust while I’m away. 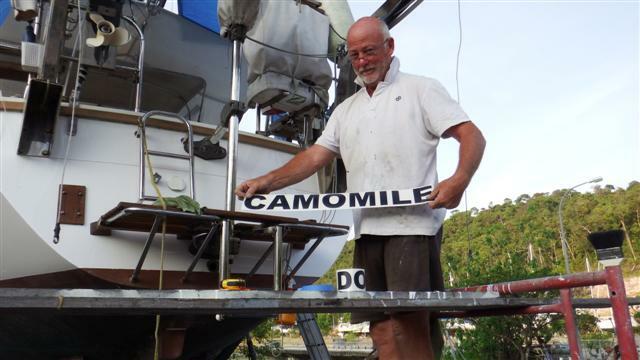 Sunday 1st March after a sumptuous breakfast in the resort (one of our little treats) Bill put Camomile’s name back on the transom. We’d had the vinyl letters made when we were in the UK Christmas before last. It looked beautiful and really finishes off the transom; we are no longer anonymous. We started striping the cockpit beginning with the cover and framework. 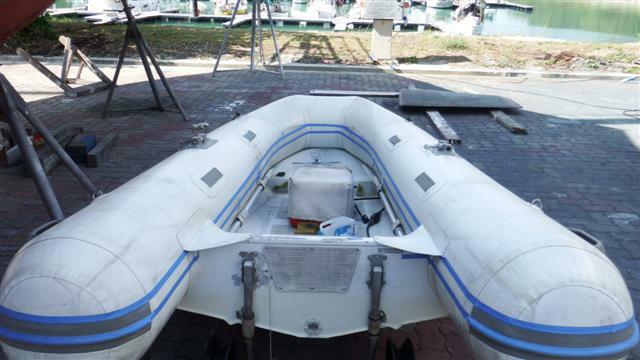 The intention is to take the cover back to CJ Marine in the UK to have a new one made. They made the original but we’ve had some modifications made to it along the way that we want them to copy. I gave the cockpit cushions a good shrub and laid them out in the sun to dry. 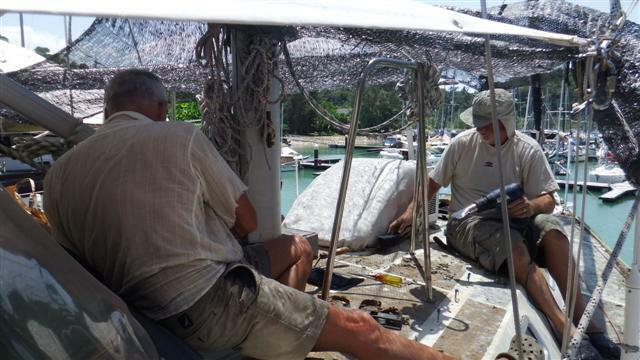 The halyard bags and the bimini cover and frame were also removed. The cockpit looks bare now. 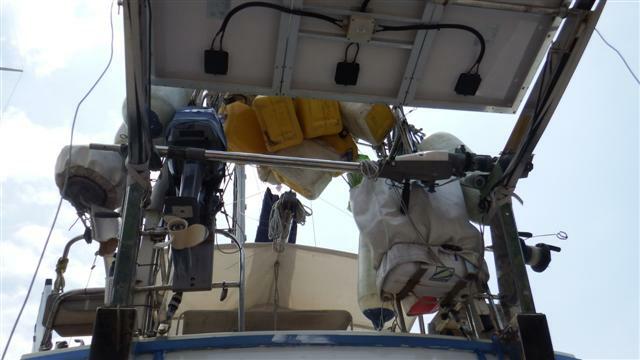 All the frameworks have gone over the davits. Just a couple of cockpit cushions left to sit on. I spent the rest of the day carrying the cockpit cushions and the saloon seating down to Norsa. 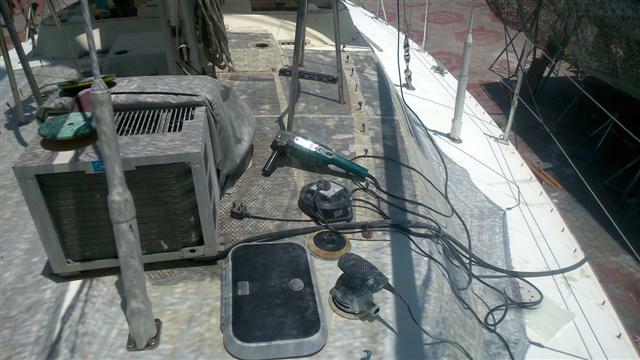 Bill intends to do some sanding inside the boat while I’m away and I don’t want them covered with dust. I also washed all the curtains and scatter cushions and took them to Norsa to store too and a box of my clothes and a box of bedding. Thanks Sara. Meanwhile Bill set his woodworking station up. 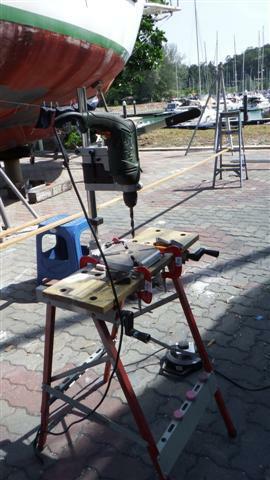 He bought this pedestal base in Australia; it clamps onto his workbench with his drill fitted into it – instant pedestal drill! 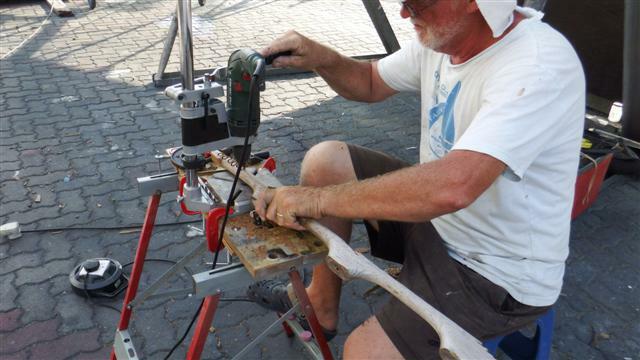 His first job was to cut plugs out of the old grab handles. The teal wood is old and worn but underneath it’s perfectly ok. These plugs are used for filling the boltholes when the new handles are fitted. ‘Waste not, want not’ as my Dad used to say. Which became a pot of plugs. 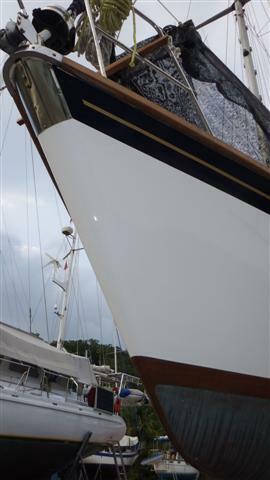 Next job was to prepare the cladding for the rubbing strake along the side of the deck. 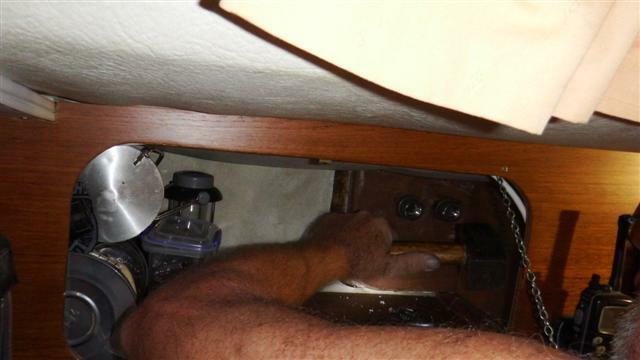 If you remember again Bill can’t remove it because the bolts are glassed in on the inside of the boat so first he prepares the wood strip by drilling the holes ready to apply. 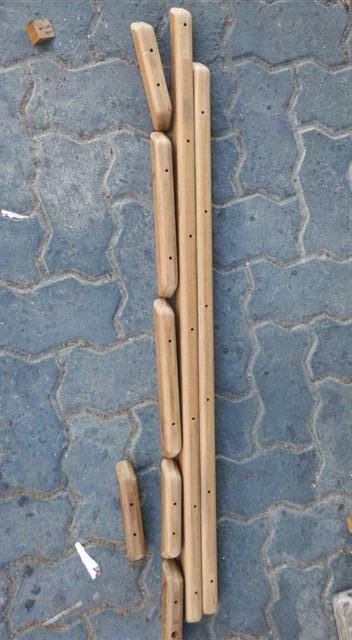 Then sections are glued and screwed and clamped into place. Monday 2nd March we got up early to apply the navy vinyl strip before it got too hot. It went on well. The secret was water, which I sprayed onto the surface and gradually removed the backing while Bill slide it into position before it got to stuck on. It didn’t allow you much time but we managed fairly successfully to get it applied. Bill continued to apply her gold stripe or sash as we say. This is why he didn’t mask the top line. Each layer of paint was gradually blended in and before applying the vinyl Bill thoroughly rubbed down the area so that there wouldn’t be a hard line. Doesn’t she look beautiful? (This section doesn’t have the cladding on the rubbing strake yet.) 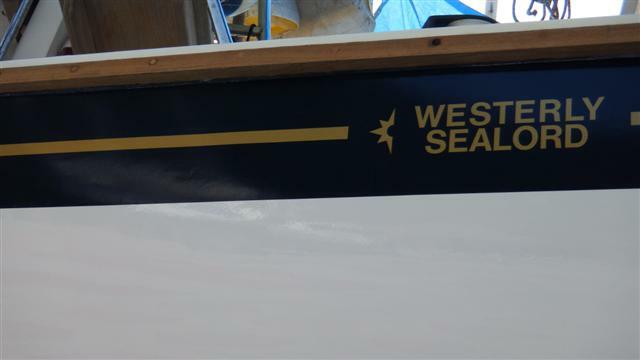 When Bill was rubbing down the old stripe he found the original position of the Westerly name under the surface so he’s put it back where it should be. We had a new neighbour today and they came over for a chat. His first comment was ‘the GRP has scrubbed up well’ Bill pointed out she had been painted to which he asked who had done that for us. They were very surprised but impressed. Later that day we signed up for another month on the hard. 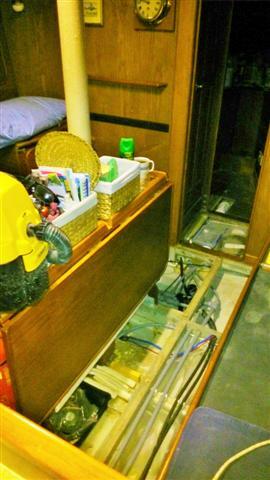 We had been trying to get in the water but the woodwork will be easier to do under the shade of the boat. 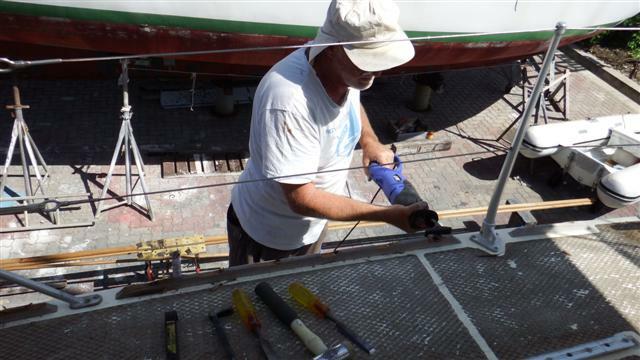 Bill continued fitting the top cladding on the rubbing strake. 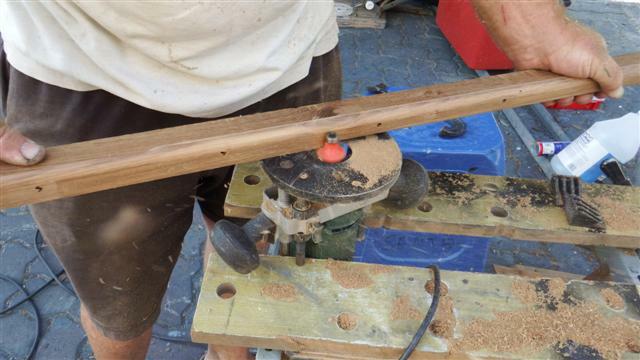 Tuesday 3rd March Bill started making new toe rails by clamping his router to his work bench and passing the wood over it’s cutter to get the shape he wanted, using the old toe rails as guides. These are the old ones he removed from the deck. This is the new set, which will go on after the deck has been painted. Don’t they look superb? Camomile is going to look really smart when we’ve finished with her. Wednesday 4th March I spent most of the day sorting and packing while Bill continued his woodwork. We had one last minute panic. I had applied for a new passport for Bill on line and was taking his old one back with me to post in the UK. After going through our sets of passport photos we suddenly realised we didn’t have any good enough for an actual passport so we hopped on the ferry borrowed one of Mr Dins cars and drove into town to get some passport photos processed. Fortunately mission accomplished. Thursday 5th March I was off to the UK. I had lots planned – surprise my sister for her birthday, Mothers day, see baby Logan and my middle sister was getting married. 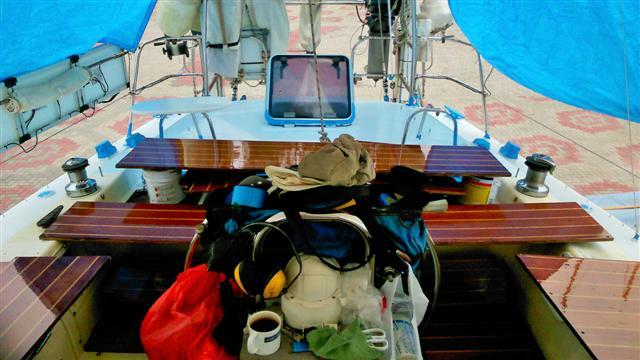 If you’re wondering why I’ve got so many bags it’s because I’ve got the old chartplotter and instruments with me to ebay plus the cockpit cover plus all my winter clothes! I’ll start this weeks blog with some information requested after last weeks blog was published. 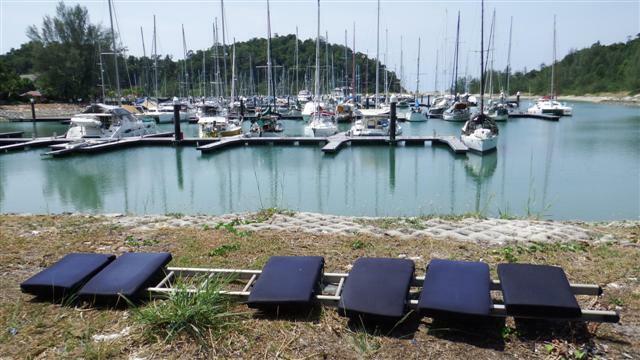 We got our mainsail from Phil Auger who is based in Kuah, Langkawi. 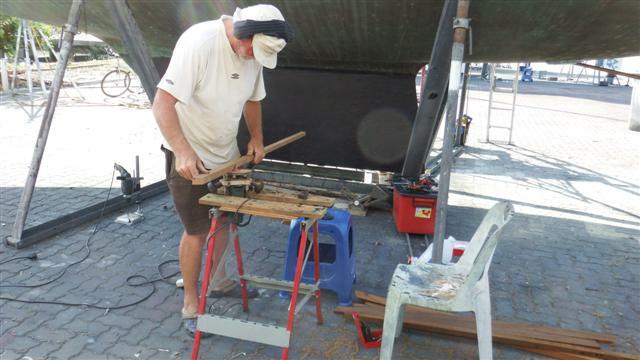 Malaysian phone no 017 625 4902 Phil came to the boat to measure up and discuss our requirements at Christmas. 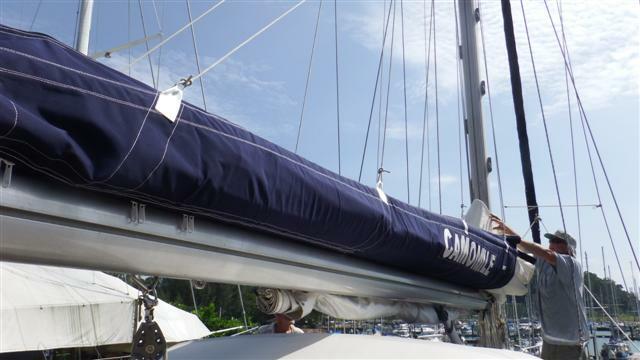 Our new sail is Marblehead Dacron fully battened with UV proof thread. 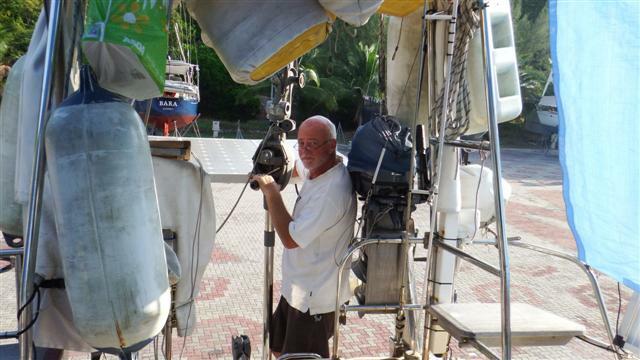 Phil is very knowledgeable about sails and forwards the requirements to a sail loft in Hong Kong where they are made. 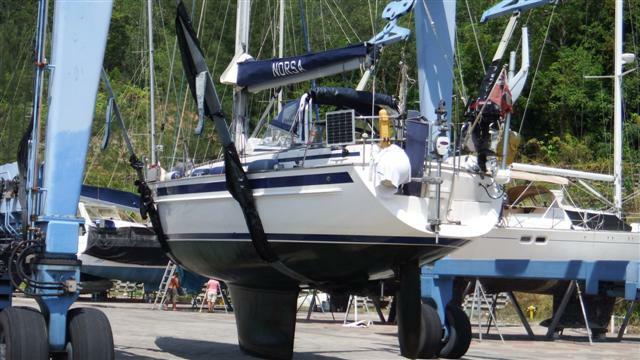 When it arrived after 5 weeks we gave Phil our old sail so he could remove the cars and sew them onto the new sail, as there wasn’t any thing wrong with them and new ones are expensive. 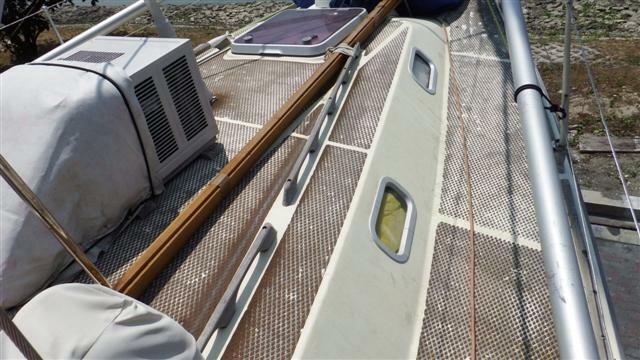 The cost of the new sail worked out to about £2300, which included the battens. Friday 20th February The 50/50 under/topcoat had been applied on Wednesday and rubbed down yesterday so this morning Bill started the first proper topcoat. He is using International Perfection 2 pack Mediterranean White that is thinned using International No9 thinners. I kept out of the way in case of problems and went off for my run. When I got back Bill had a big smile on his face and said he was pleased with it; praise indeed. 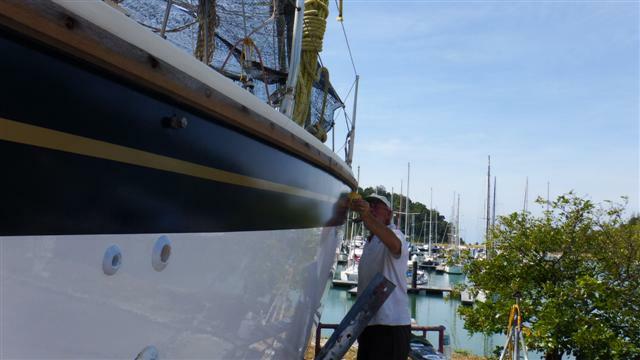 As a result of the successful first topcoat we’ve taken the decision to stay at Rebak and Bill will now paint the topsides too. This is a huge undertaking but as you can see in the photo the coach roof is as bad as the hull and having now started it makes sense to continue. You can also see how worn the Treadmaster has become. 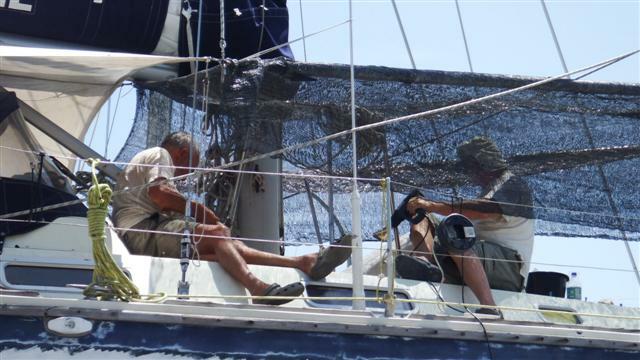 The problem we have is our friend Norman, who’s just arrived, has a couple of days spare to help Bill with the removal of the Treadmaster and if we moved the boat there’s a limit to how much of the deck gear could be removed. 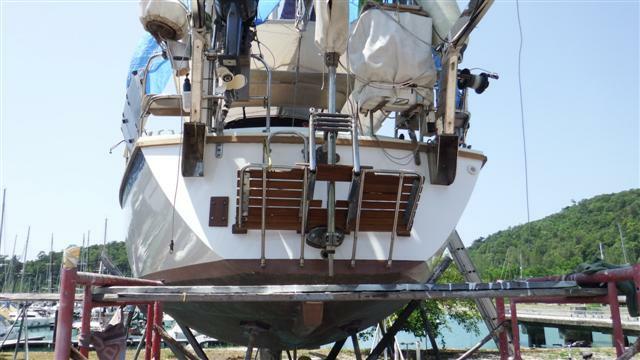 We couldn’t undertake a 2 day passage with holes in the deck and if we didn’t remove the deck gear Norman wouldn’t be able to help with the removal of the Treadmaster; so you see our dilemma. In the afternoon Norman came to help Bill start removing the Treadmaster. After a lot of experimentation with scrapers, solvents, heat guns, multi-tools etc. it really seemed that scraping it laboriously with chisels was the only thing that removed the cork surface leaving the thick epoxy glue to be ground off. All in all, regardless of the extra painting work, this was going to be an extremely difficult and time-consuming job. To help with the task, as we weren’t moving now, I was able to remove all the lines off of the deck. The fuel cans needed to be moved too so I tied those to the A-frame, which is looking rather overloaded. 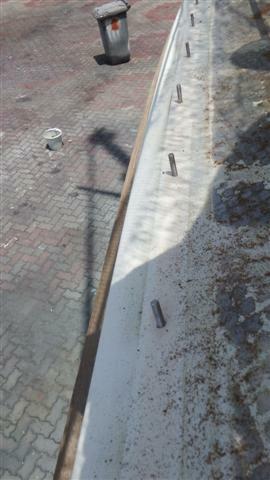 Bill also removed the grab handles, which he’s replacing, but this left bolts sticking up from the deck. 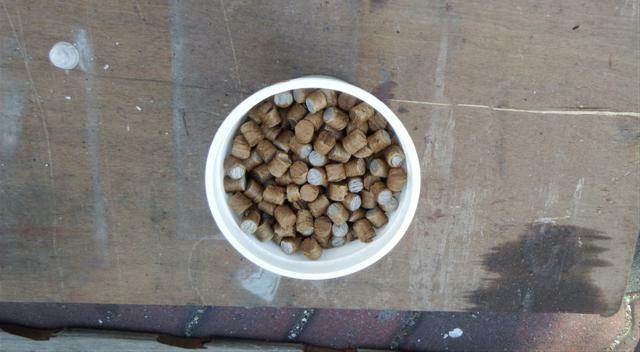 Bill carefully attached a nut to the top of each one with a bit of blue masking tape around them so that if anyone sits or stands on them hopefully they won’t do to much damage to themselves. The dinghy cover is almost finished. To attach it to the dinghy I’m going to use Velcro but first the ‘sticking’ side of the Velcro has to be sewn onto strips of Neoprene, which in due course will need to be glued onto the dinghy. So I spent the rest of the afternoon sewing the strips of Velcro to the neoprene. On Camomile I am lucky enough to have a fridge and a freezer. The freezer is a Waco unit and continues to work as normal while we are out of the water. The fridge is a new water-cooled unit that Bill fitted in NZ and unfortunately was protesting about being out of the water without any water to cool it. I have turned it down to stop the unit overheating but it’s protesting too much so I’ve decided to turn it off. In this heat that’s a huge problem but I’ve turned the freezer up so it’s not freezing and have moved some foods in there. It just means I’ll have to shop more often. Wash day again. 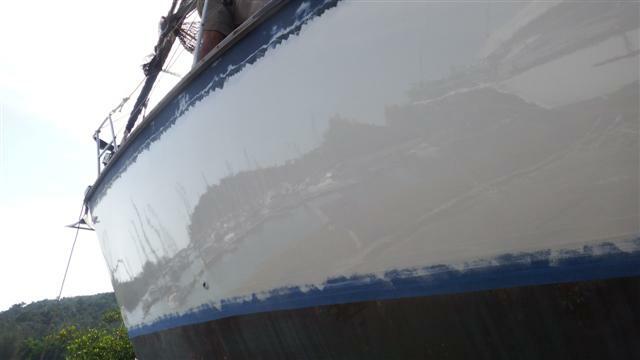 Saturday 21st February Bill was up early to give the transom its first coat of Mediterranean white to match the rest of the hull. 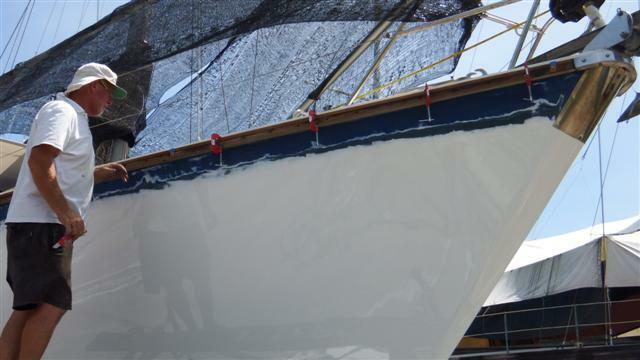 It can’t be painted on the same day as the rest of the hull because Bill has to start on the port aft quarter first thing moving around the bow and down the starboard side before the sun gets too high. 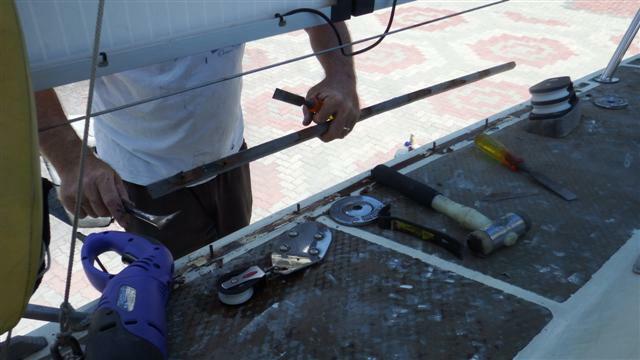 By that time the sun is on the transom and it’s not good to apply the paint in direct sunlight. 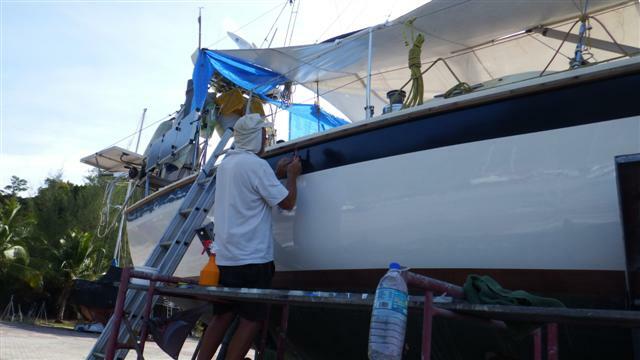 If Bill painted the transom first he wouldn’t get all the way around, therefore he paints them on alternate days. The rest of the hull had a final very light rub down for the second and final topcoat tomorrow. Meanwhile Norman arrived to do more Treadmaster scraping. I took my bike on the ferry to get some shopping. The shops should be open now after Chinese new year. I decided to cycle to Hegners otherwise know as the Australian shop because they fly goods in from Australia. It’s a good 6kms away but the exercise will do me good. I cycled round the airport perimeter fence and continued along the road to the shops. I was so cross because it was SHUT. I realised I had 20 minutes before the next ferry went so I cycled as fast as I could back again. I did it in 19 ½ minutes and just made the ferry! 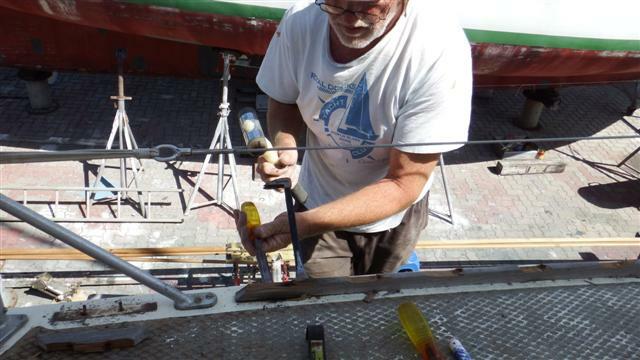 In the afternoon Bill started stripping the aft deck, removing the grab handles and covering them with more nuts and blue tape. 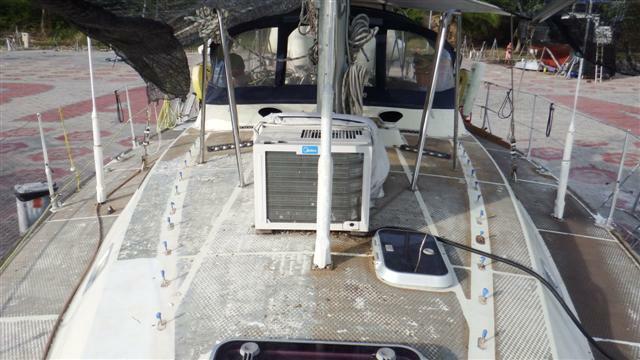 The dorade vents were also removed and I moved the lines and the aft fuel cans. When it was all cleared I vacuumed the whole deck to clear all the dust from the deck ready for Bill to paint the final topcoat in the morning. There must be no chance of anything ruining it. There was time for a swim at the end of the afternoon and a meal with Norman and Sara. In the morning I went for my run as Bill started painting the Final coat. I got back and nervously asked how it was going, “Great” was the reply; music to my ears. 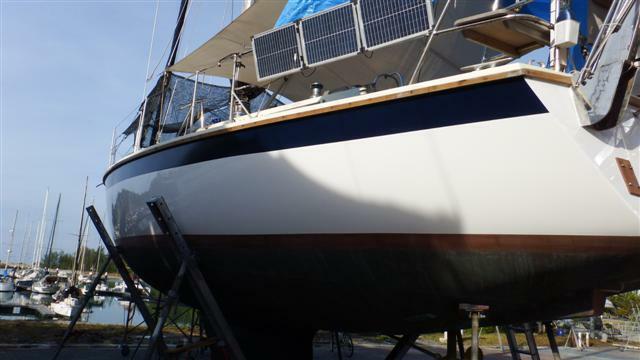 Bill was really pleased with the final topcoat; all those hours of preparation and rubbing down have paid off. We have a shiny boat. Paint dries very quickly here and within a few hours it was dry enough to remove the masking tape. It was very satisfying pulling it off; like peeling wallpaper, we both had a go. It has to be left a week now until we can put the blue vinyl stripe on; that will be fun! If it will load I’ll put a video of our beautiful shiny boat on facebook. We went off to the resort to celebrate with a couple of their lovely coffees. When we got back Norsa was just being lifted out of the water, she’s come to visit Camomile having her spa treatment. Norman and Sara are going back to the UK for the summer in a few days. 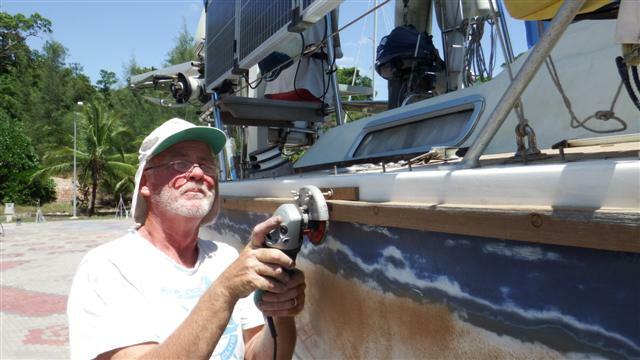 I spent the rest of the day writing and publishing the blog and Bill rubbed down the transom so that could have its final coat tomorrow. 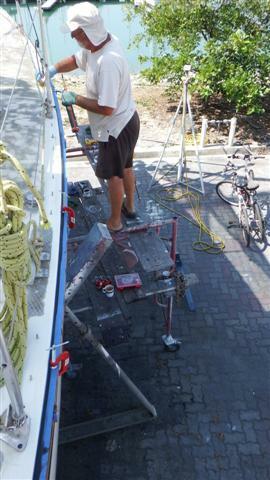 First thing in the morning Bill was up to put the final coat on transom but this time he was not happy. I thought it looked ok but Bill said it had fluff in it and there were runs. We went off on the ferry to get one of Mr Dins cars to do shopping but Bill spent most of the day being cross with himself. We did our usual tour of the hardware shops for various bits and did the food shopping. 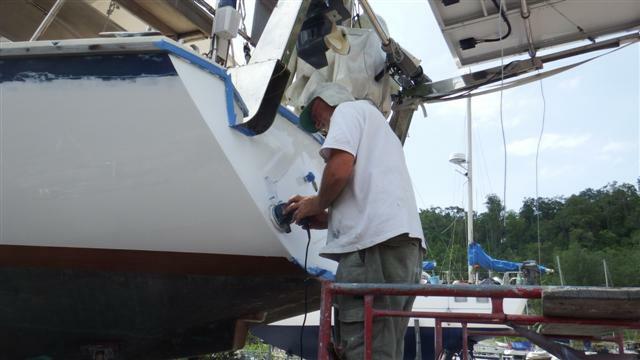 By the time we got back Bill had calmed down and he got straight out to rub the transom down so it could be painted again in the morning. 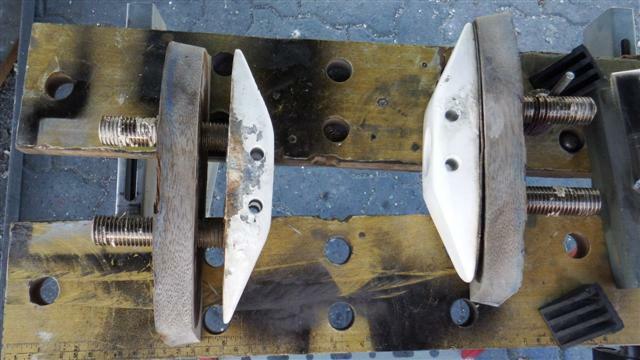 At the end of the afternoon Bill removed the lugs for the yachtlegs that will be in the way when we have to apply the stripe. They put up a bit of resistance so using his club hammer made him feel better. They are chunky old things but then they need to be to hold the boat upright when the yachtlegs are in them. The holes had to be covered with tape to keep the mozzies out until the blue strip goes back on. Final coat on the transom in the morning and this time Bill was happy. Bill started burnishing the copper coat with very fine sandpaper, I washed the dinghy ready to do the gluing first thing in the morning and Norman arrived to do more scraping although he has to work on the bow so that he doesn’t spoil the transom but it’s usually dry within a few hours. Norman has a saying ‘Don’t sack I boss just give I a bollocking’ but today he was working away and suddenly he said ‘Why don’t you sack I boss!’ Haha, its difficult work and we are grateful for the help he is giving, it’s in return for the jobs Bill has helped Norman with on Norsa. At the end of the day the decks looked like this and it was time for a cold beer while I vacuumed the decks down again. It was too damp to start the gluing on the dinghy first thing. The humidity in the day often leaves dew the next morning for an hour or so. 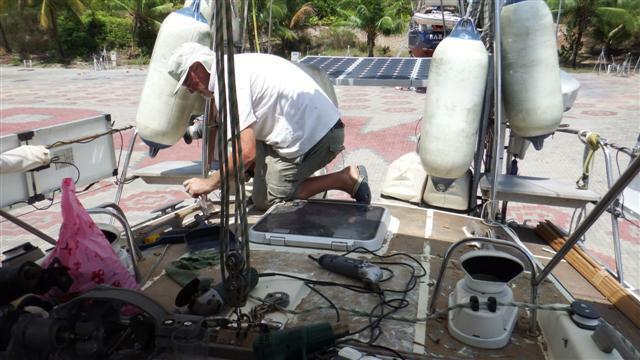 Bill moved the dinghy into the sun to dry off and started reassembling the transom starting with the bathing platform. I cut to length and marked the neoprene strips and laid then out ready for gluing. 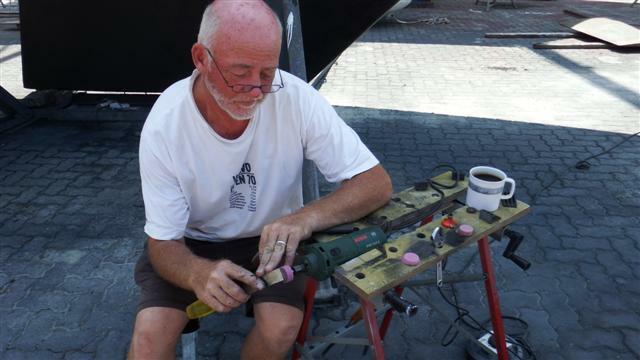 Before it got too hot Bill started on the dinghy by first masking where the glue was going to go. I had everything ready and first handed him the primer which he applied and also to the backs of the strips of Neoprene. Next the glue had to be mixed with a small quantity of hardener and applied to the dinghy and the neoprene strips and then a second round of glue to the dinghy and strips. I passed the strips to him one by one so he could stick them in place. We had to work fast because the glue was going off quickly in the heat and the strips were sticking to each other but we did it. Finally the masking was removed. I now have to wait 3 days for it to completely harden before I can finish the cover and use the velcro. 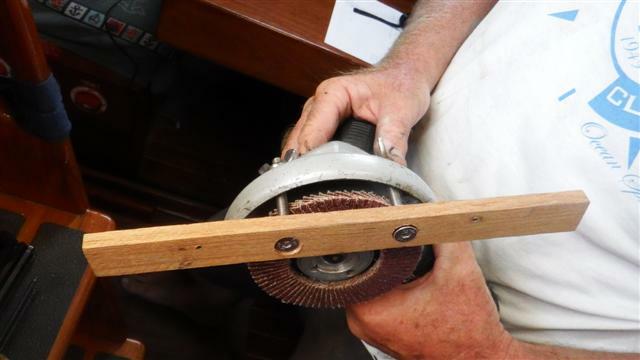 In the afternoon Bill continued with the transom by refitting the serviced Hydrovane and Norman started sanding with the big grinder but he still wants to be sacked! 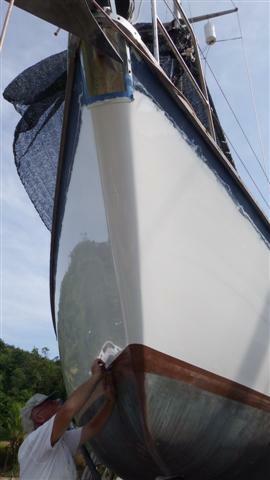 At the end of the day the finished shiny transom looked like this; just needs her name reapplied now. We try to be self-sufficient as much as we can and this is Bill regrinding the chisels, he has also made his own cutters because they are so specialised that no-one makes them. 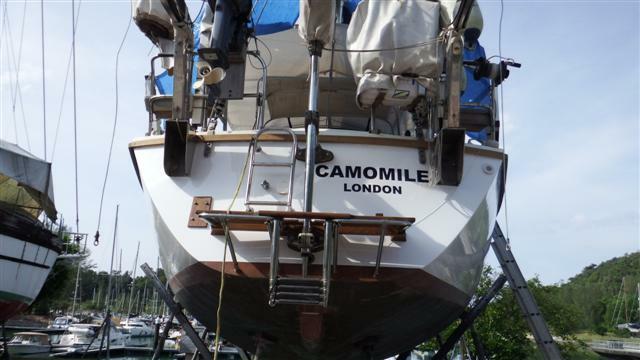 I gave Camomile a pedicure after we had scraped her toes on the coral last year (I anti-fouled the keel!) Nice shade of black. It had 4 coats in all during the day. 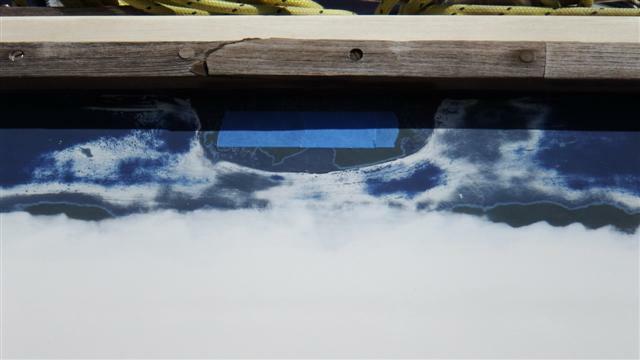 Bill started on woodwork by removing a section along the top of the rubbing strake. 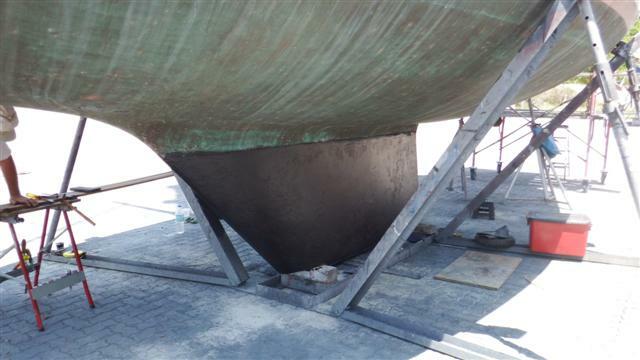 The rubbing strake can’t be removed because it forms part of the bond between the deck and the hull and the nuts inside are glassed over and inaccessible but Bill intends to skim it top and bottom and clad it in new wood; a bit like a crown on a tooth. He makes a cut all along the top of the rubbing strake. These are the new tops and sides jointed and glued drying. Unfortunately they turned out too weak to lift so Bill is going to glue them in place in sections. 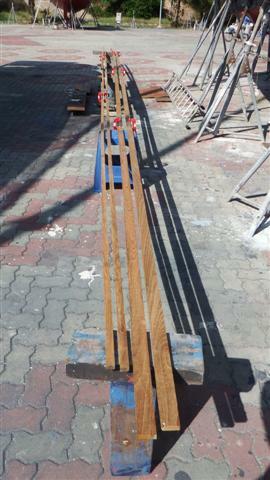 We bought the wood in Thailand; it’s Burmese quarter sawn teak. 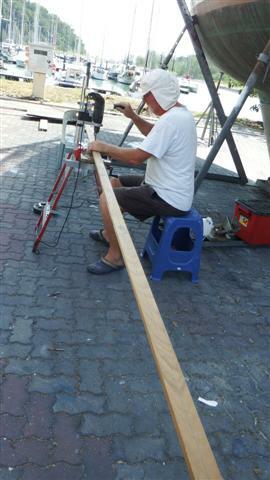 Bill took his cutting list to several wood yards and agreed to buy what he needed from a supplier near Yacht Haven in Phuket. The guy called James allowed Bill to pick his pieces and let him have a carpenter for the day to help him saw and plane it to size. 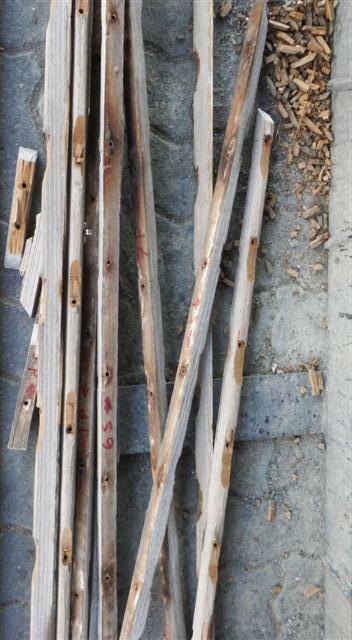 We have enough wood to replace the rubbing strake, the toe rails, all the grab handles, all of the new cockpit planking, a seat by the steering wheel, a dolphin seat and a couple of other pieces. 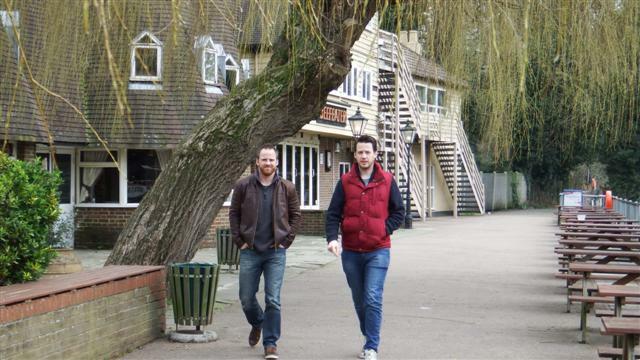 The wood, planned with the use of the carpenter for the day, cost just over a thousand pounds. I dread to think how much it would have cost to buy the pieces ready made. We had a farewell meal with Norman and Sara in the evening. Bill made this routing guide to fit onto his angle grinder to true up the sides of the rubbing strake to set it up for bonding later. This is it in action. It was very efficient. Norman wanted to do a couple of hours sanding before he left. 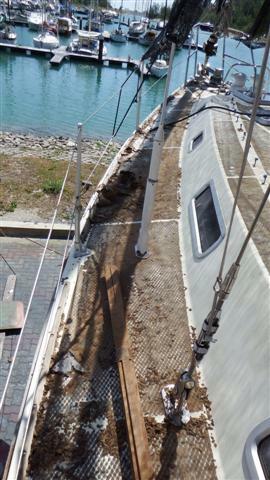 This is the aft deck after he finished with it. Bill has still got to do quite a bit but Norman’s help has made a good start. 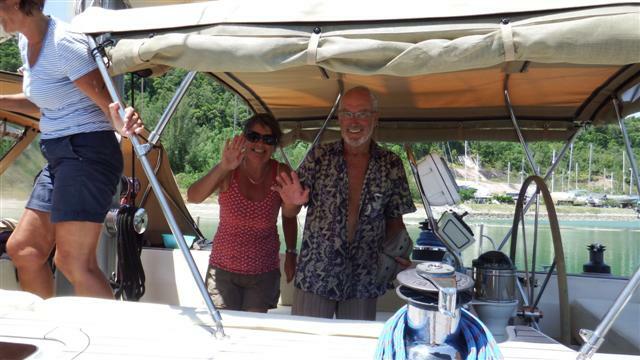 At 2pm we cycled down to A pontoon to say goodbye to Norman and Sara. 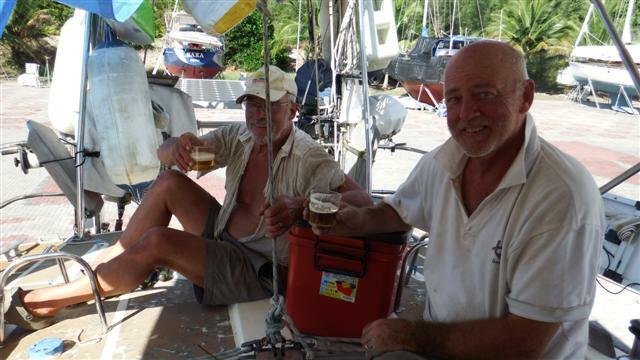 They were leaving with Susie and Rex on board Ariel bound for Panang then onto the UK on Wednesday. Poor Norsa up on the side behind them looked on sadly to see them leave in the lovely Ariel. 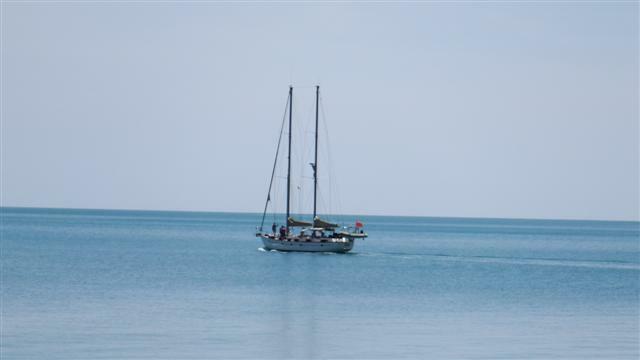 After they left I cycled to the other side of the island to see them motor out into the sea. Goodbye Norman and Sara see you at the end of the year sometime.